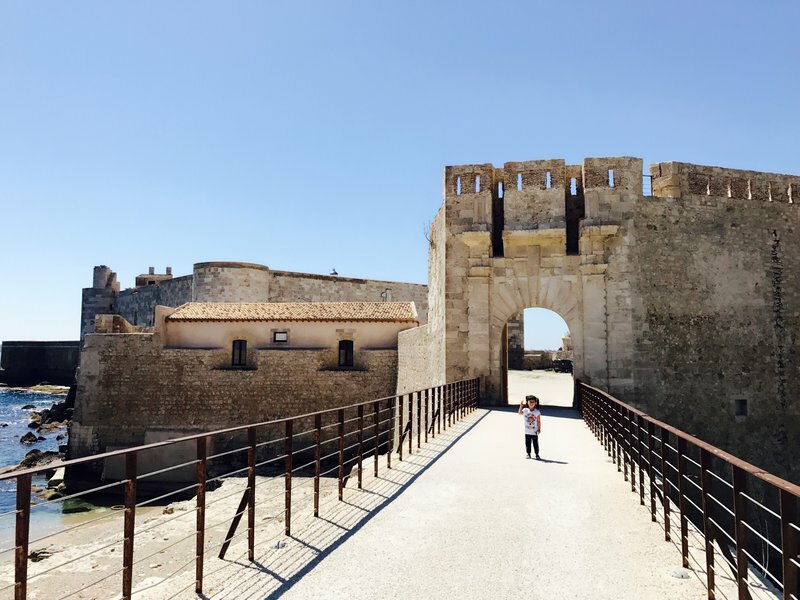 One of the most difficult decisions in our short itinerary was what to do about Siracusa. 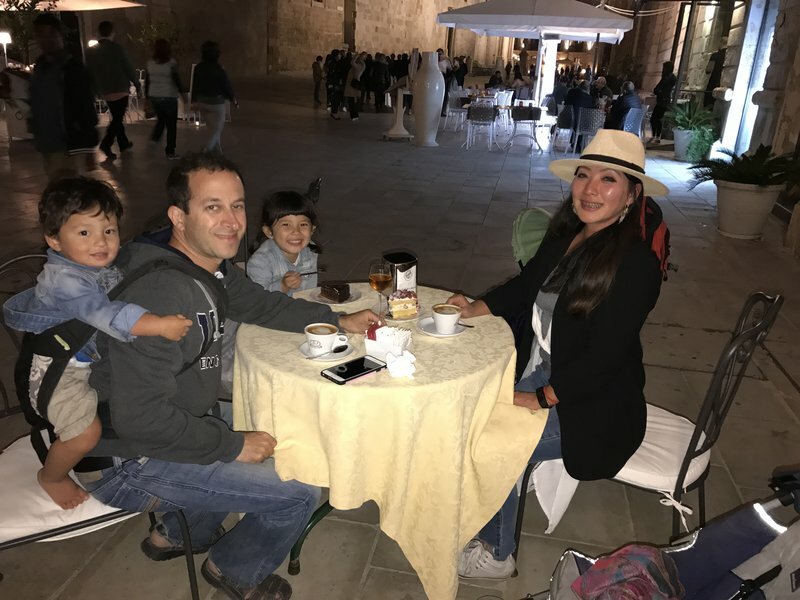 Because of the limited ferry schedule, the two nights I wanted in Siracusa would have only left one day to explore Malta which would definitely have not been enough. 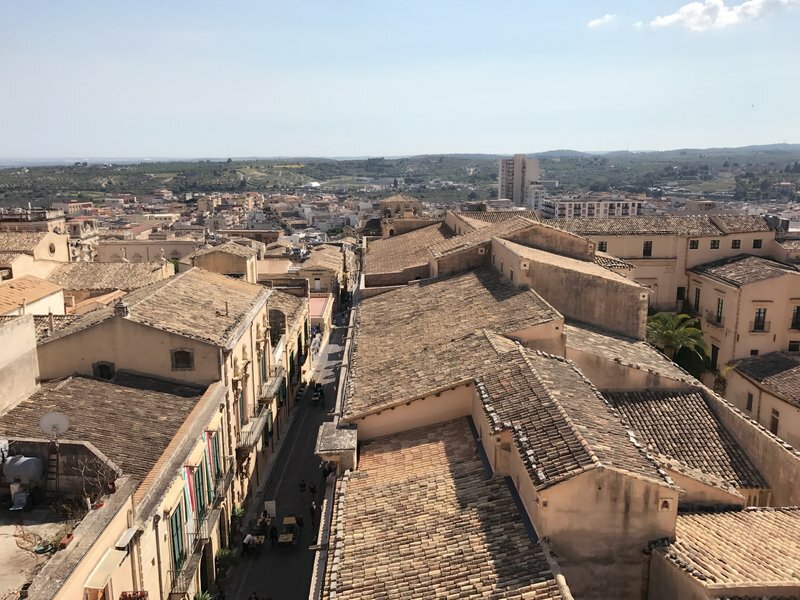 In the end, I decided that we would likely be returning to Sicily but Malta was much more questionable. Better to allocate more time to Malta so we wouldn't feel like we'd missed too much there. 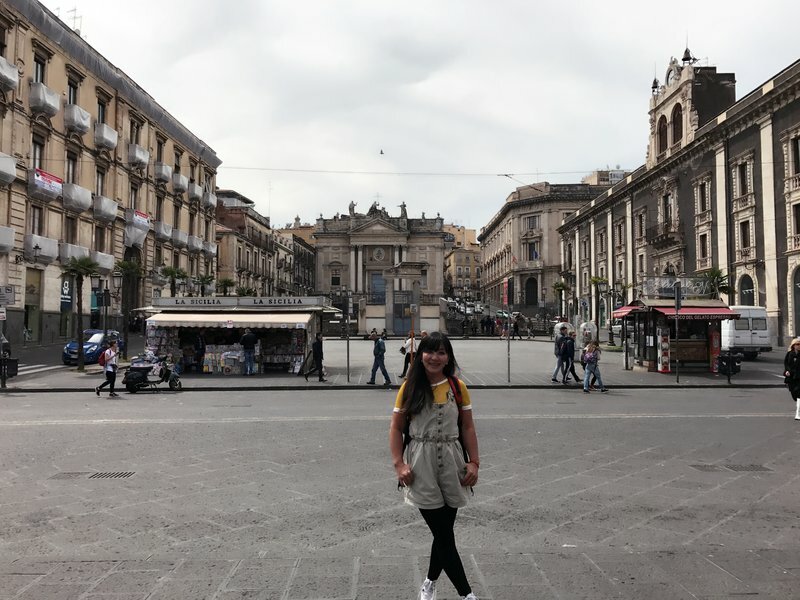 Because that only left us with one evening and one morning in Siracusa, I decided we would stay on the island of Ortigia and not make any attempt to see the mainland half of the city. 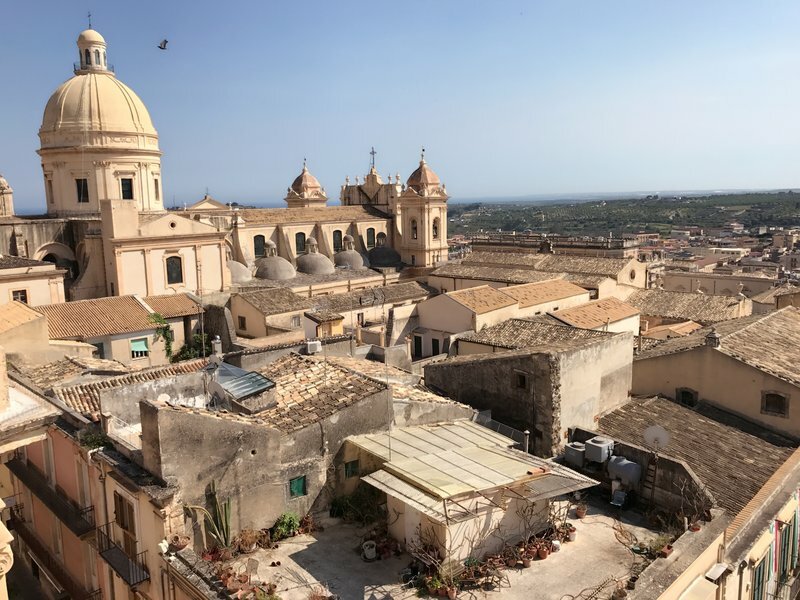 I wouldn't have thought it was possible, but our Booking.com B&B in Ortigia was even smaller than the one in Taormina. The door from the street opened directly into the first bedroom, and there was a smaller bedroom in the back. Instant zero to 100% occupancy. 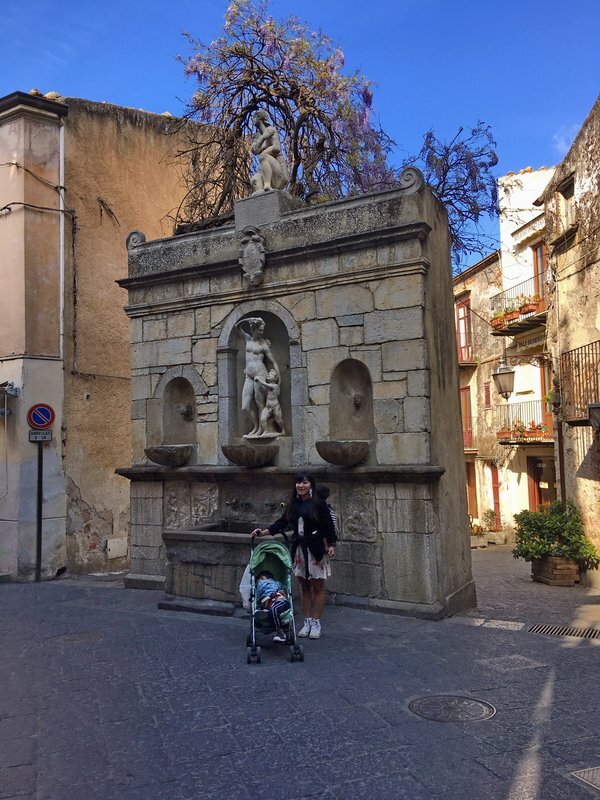 We immediately plunged into an enticingly narrow alley which led us through charming small squares and more alleys to Piazza Archimede and Giulio Moschetti's epic Fontana di Diana. 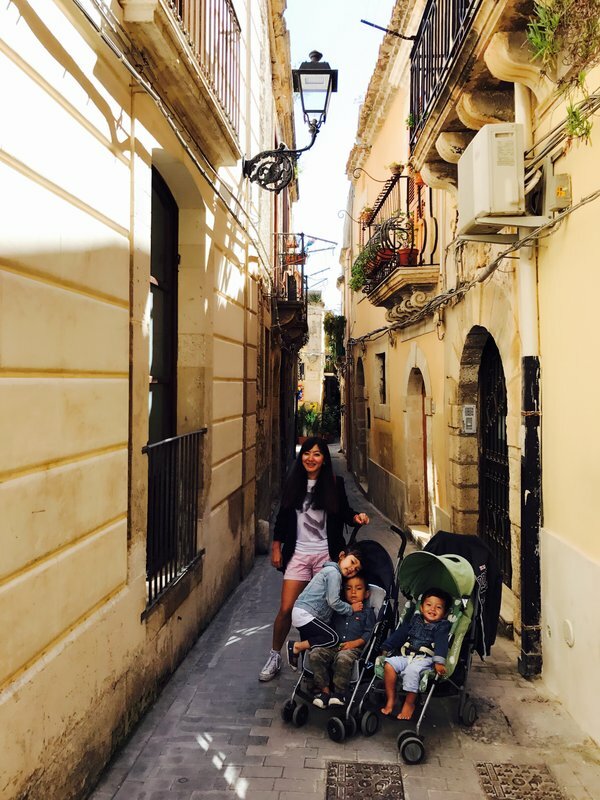 We were now in the heart of Ortigia. 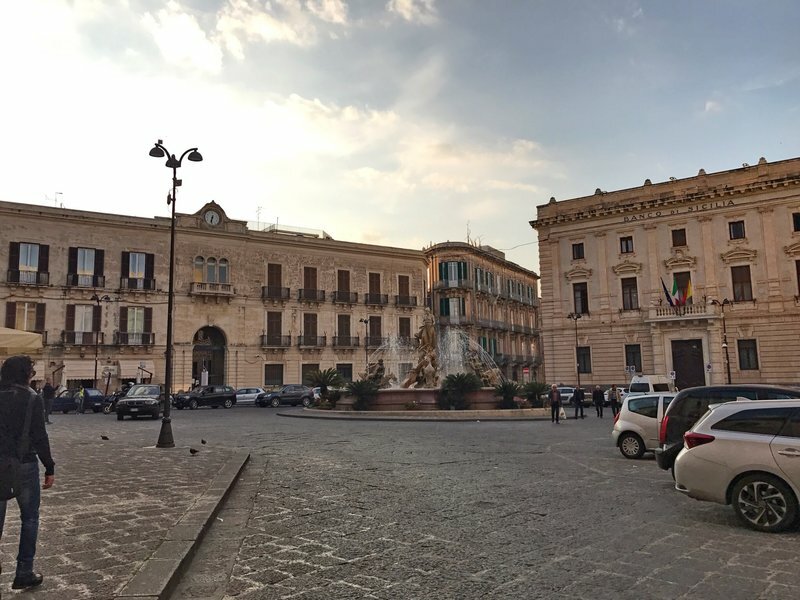 From Piazza Archimede the touristy but charming Via Roma coursed southward and we followed it to Piazza Minerva, a white flagstone-paved pedestrian street lined with cafes and stately buildings. 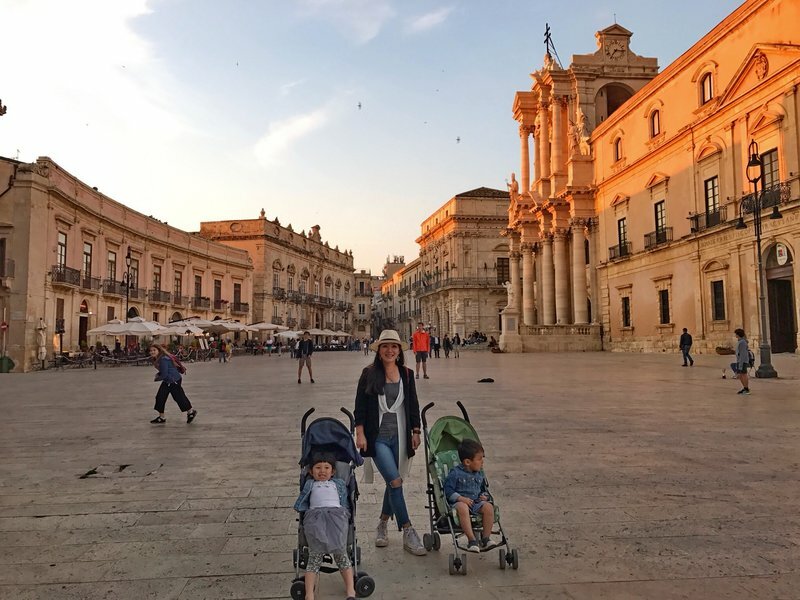 Piazza Minerva took us to Piazza Duomo, where the setting sun was throwing an orange glow onto the upper part of the Siracusa Cathedral. 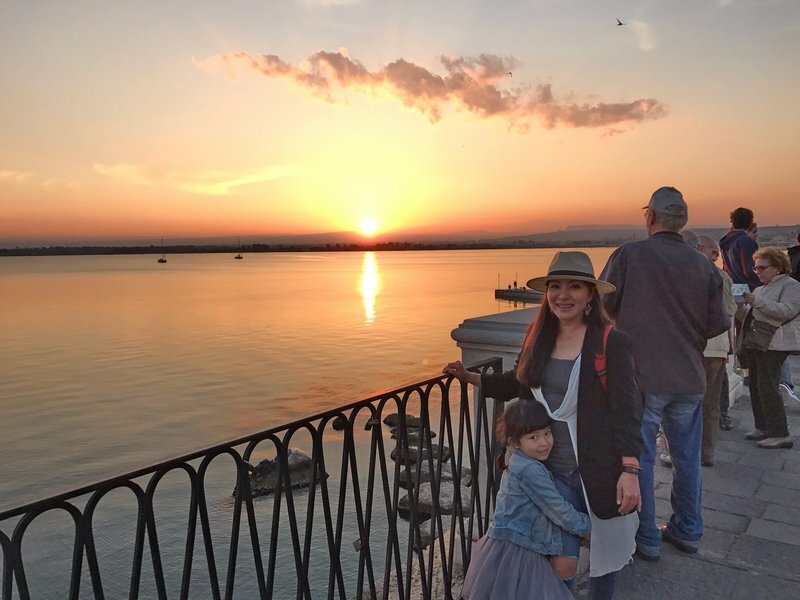 South of the cathedral, we encountered the seaside promenade Lungomare Alfeo where people were gathering to watch the sunset. 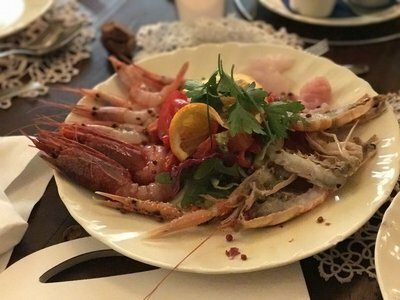 Rather than battle for an unreserved table at a highly-recommended restaurant, we took an educated guess at which of the waterside restaurants looked best and did fairly well with our choice. 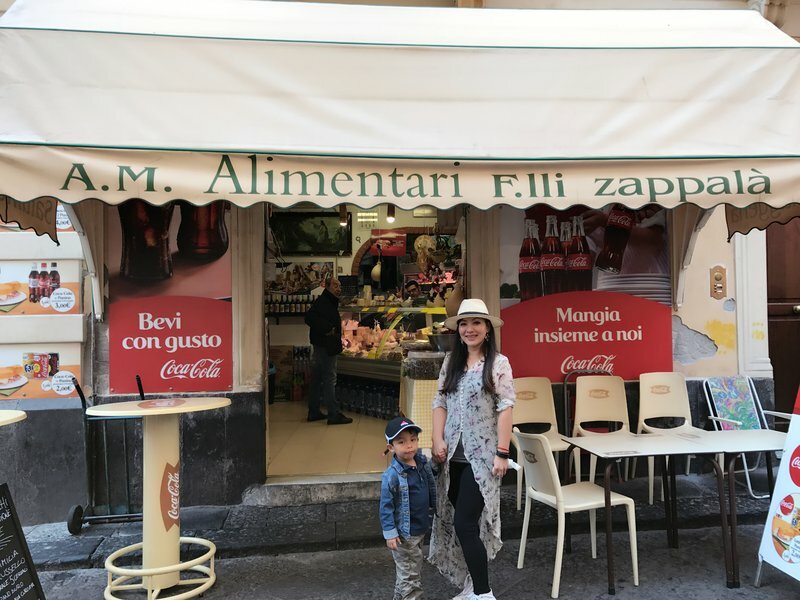 On the way back home, we stopped at the gelateria at the corner of Piazza Minerva and Via Roma for cake, cappucino, and a cold glass of Zibibbo. 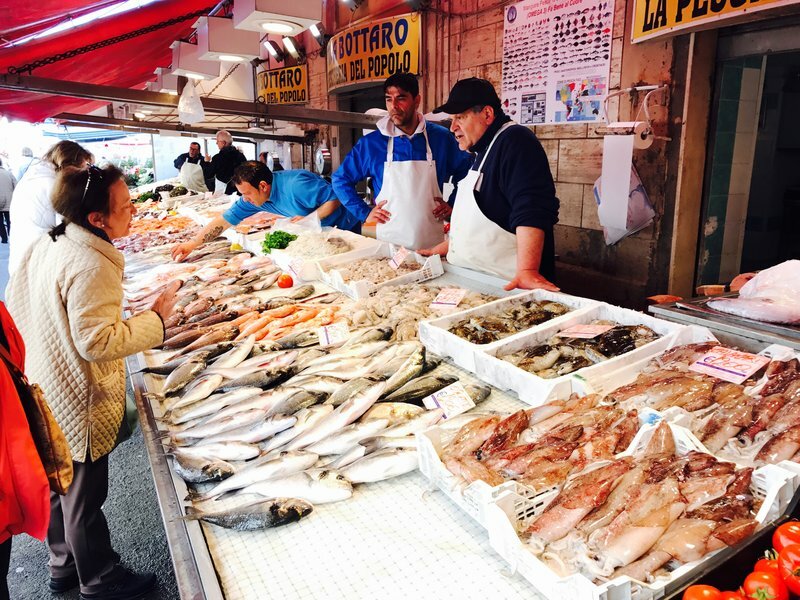 The next morning we were laser-focused on Ortigia's daily produce and fish market, which my research indicated was one of the best in Sicily. 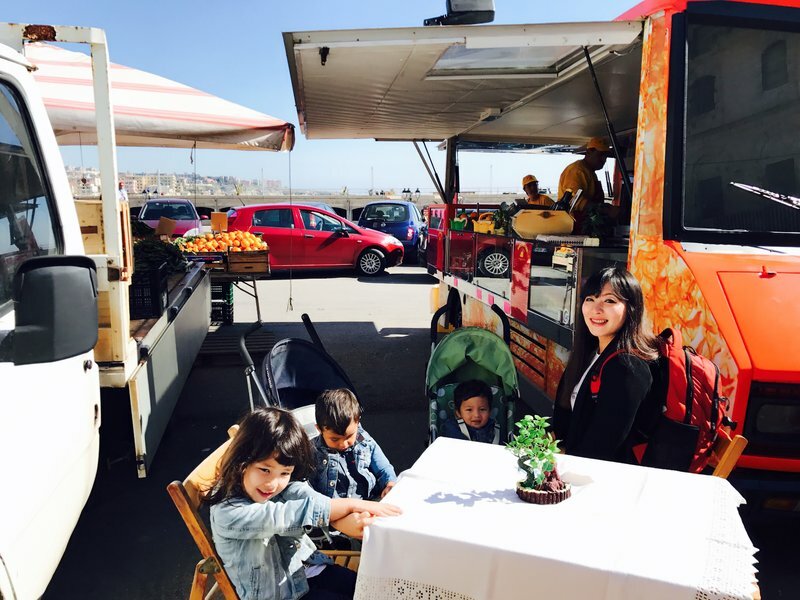 The first place we saw was a food truck selling horsemeat sandwiches and we sat down without hesitation. 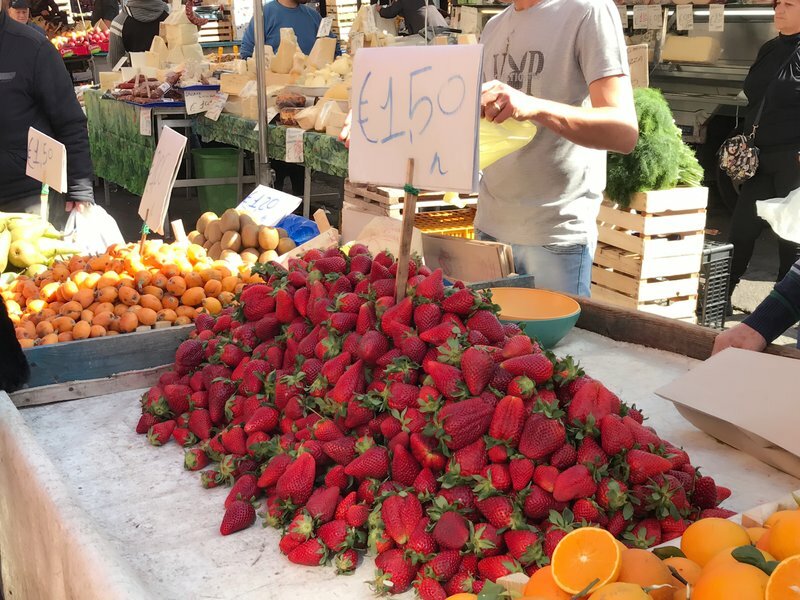 I purchased more amazing strawberries and we had them with the sandwiches and fresh-squeezed orange juice. 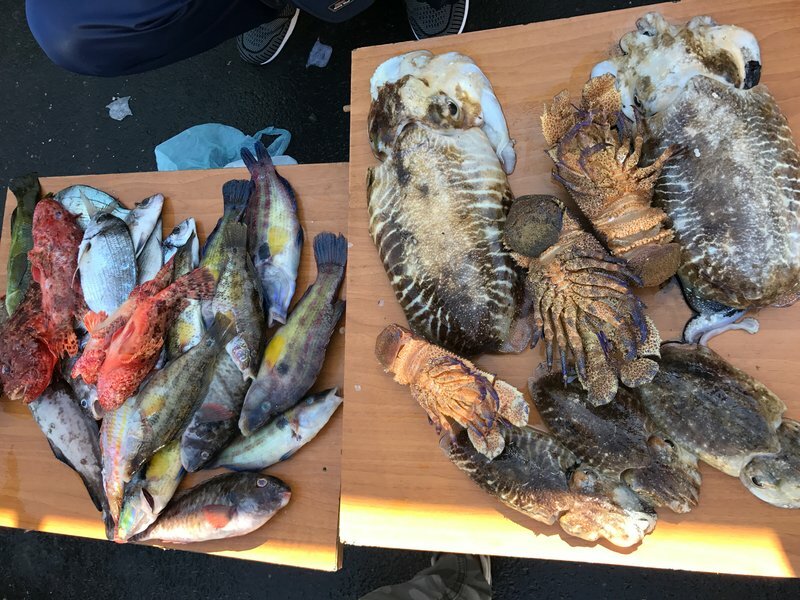 Before tackling the crowded market, we passed by some stalls where local fishermen were selling such oddities as skate, eels, and slipper lobster. 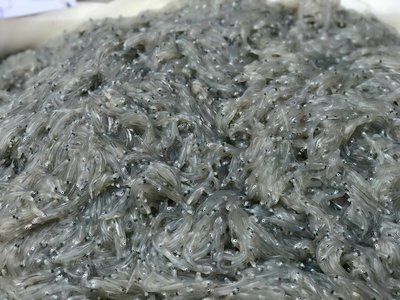 At one stall a couple of guys were extracting sea urchin roe from the shells, but at ten bucks for a shot glass of roe we decided to pass. 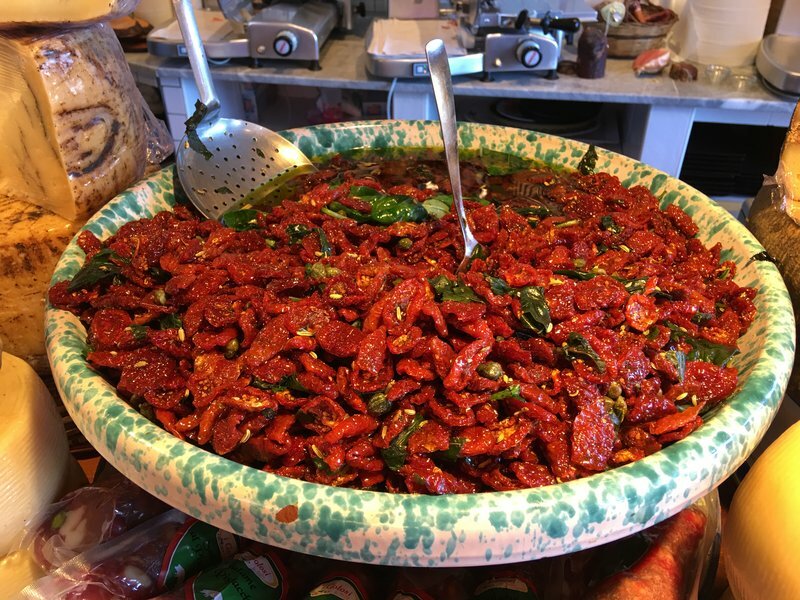 The Ortigia market wasn't as large as the ones in Palermo and Catania, but it was the most artisanal we had seen. The cheese and sausage vendors seemed to have every variety imaginable, and every fruit and vegetable looked like it had been individually polished. It was also one of the more crowded markets we had seen, mainly with tourists. We didn't have to leave town until two, so we still had plenty of time to explore the island. 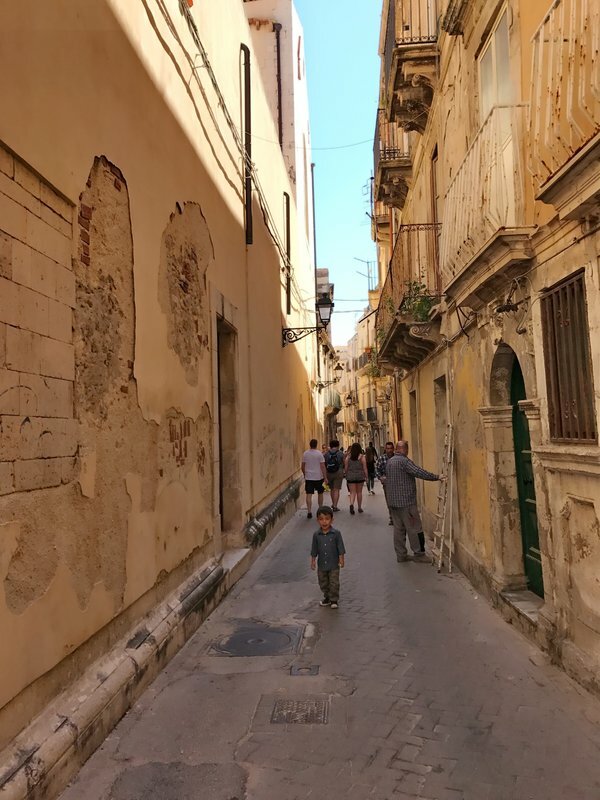 We plunged back into the network of alleys we'd discovered the previous evening and did our best to make our way down to the southern tip of the island without using any of the wider streets. 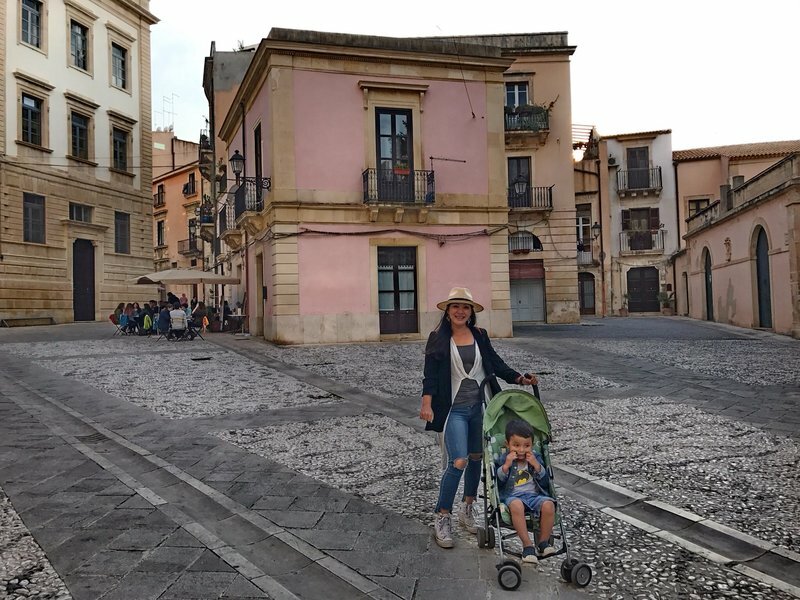 We emerged from the alleys at the base of the small peninsula at the southern end of Ortigia. 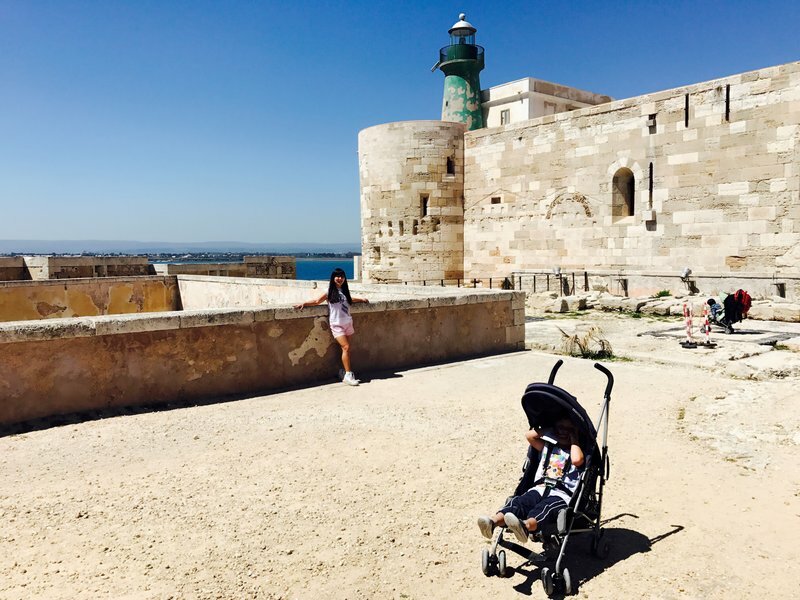 At the very tip of the peninsula is Castello Maniace, a well-preserved medieval fort that we had just enough time to explore. 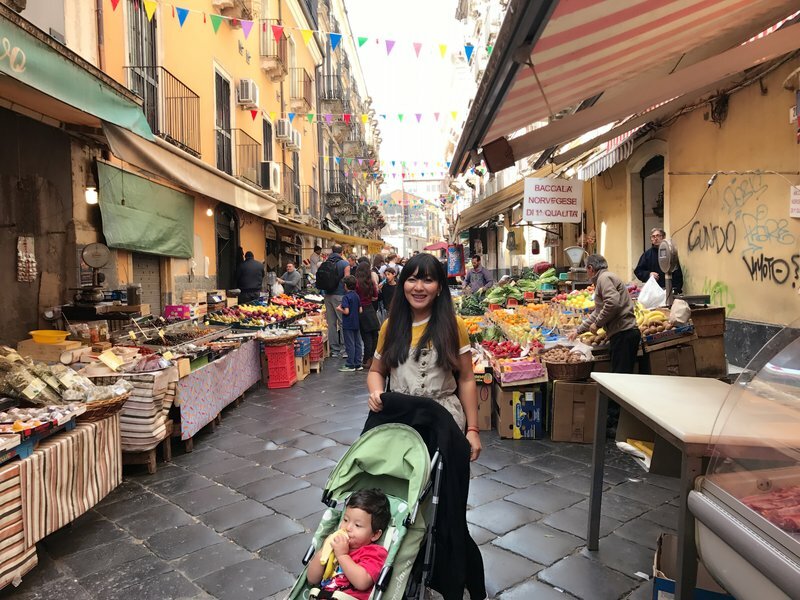 We made one last stop at the Ortigia market before retrieving the car. 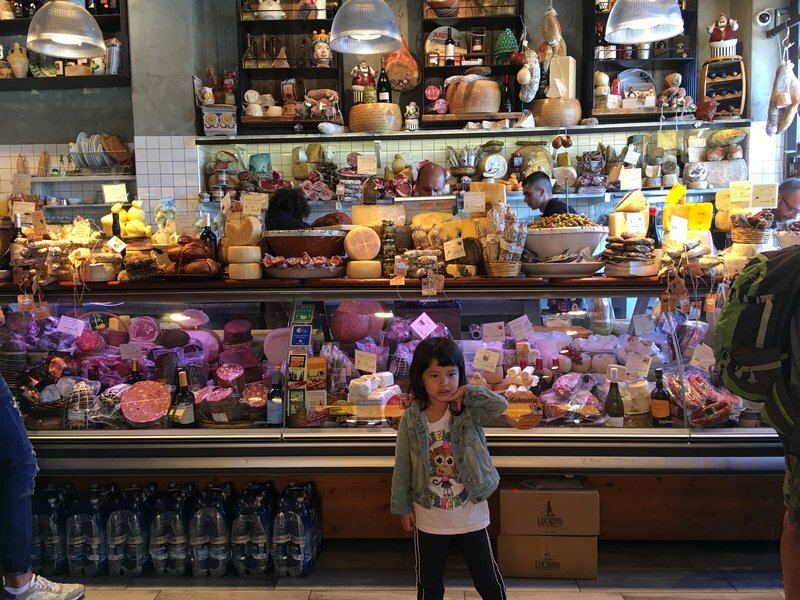 I'd spotted an absolutely amazing deli on the main market street that morning but we'd just finished eating. 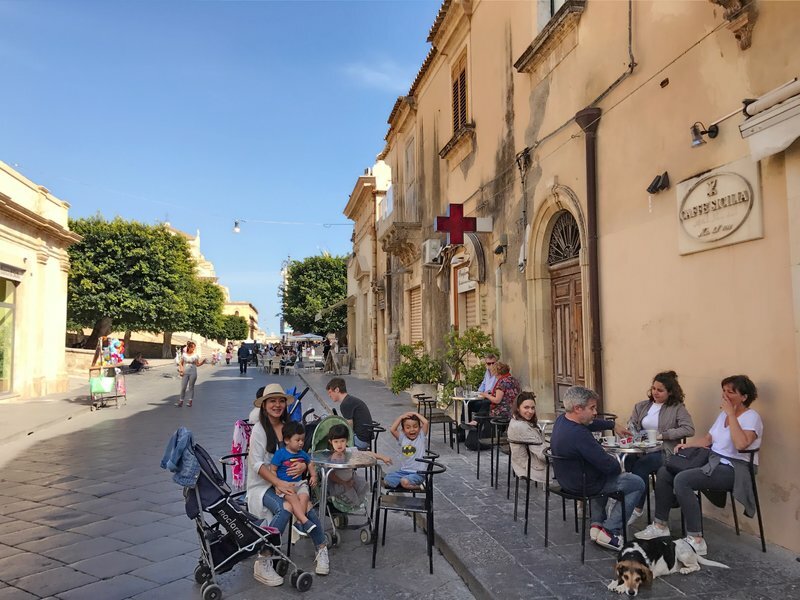 Now that we'd burned off some calories walking around, it seemed like a good idea to get some sandwiches to eat on the drive down to the Malta ferry at Pozzallo. My only regret is that there wasn't an option for a panini with everything. Another day in Siracusa would have definitely been welcome, but as always I was amazed at how much we were able to see and do in less than twenty-four hours. 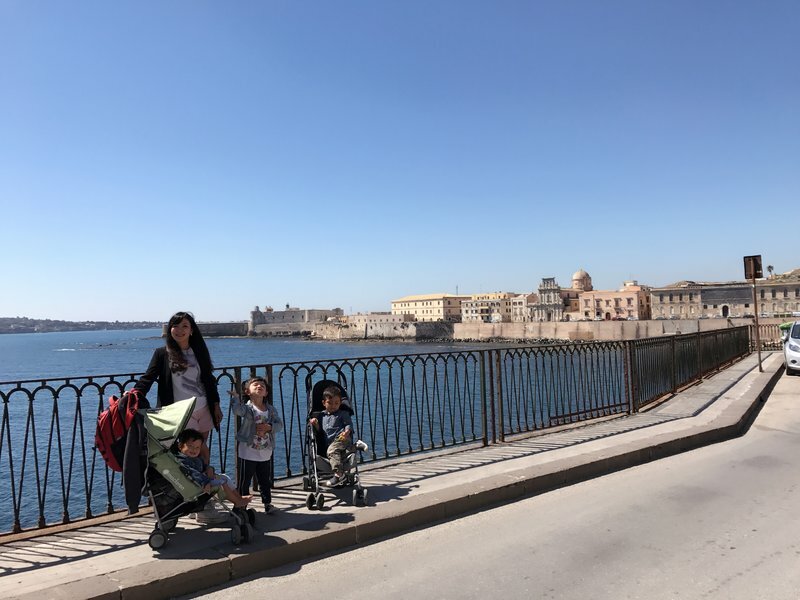 We had given ourselves plenty of time to get to Pozzallo and there wasn't any traffic, so I had time to drop everyone off at the check-in for the ferry before returning a short distance up the road to the paid parking. I followed the signs up an incline and immediately encountered a guy in a yellow safety vest who waved me into a spot on an ungated dirt lot close by. I got out and the guy immediately came over gesturing and making sounds that sounded like Italian but were mostly incoherent. It was clear he wanted money, and eventually he wrote down a figure that didn't seem too unreasonable. 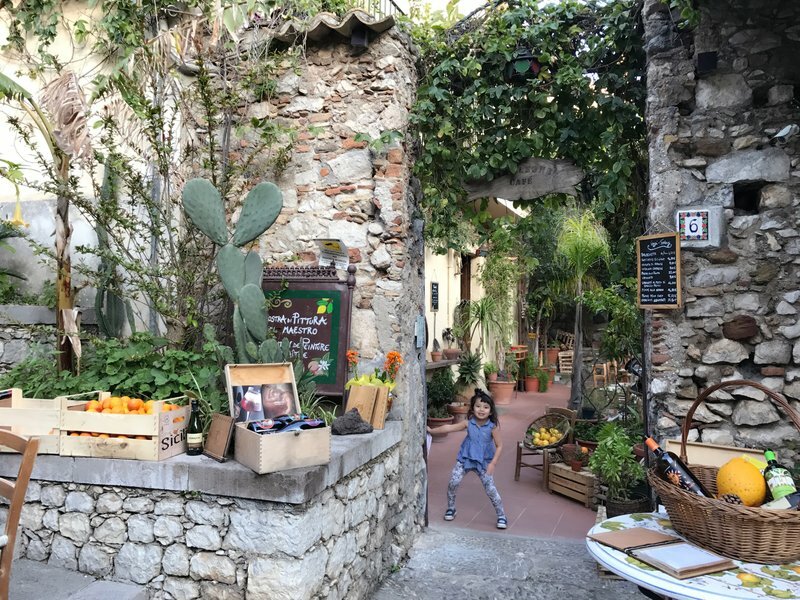 I was about to pull out my wallet, but I suddenly remembered the parking scam for the Erice funicular that I'd read about. I asked the guy if he would give me a receipt, and he pulled out some slips of colored paper and waved them in front of me. I could see they were completely blank, which was enough for me to take a closer look at the surroundings. At one end of the dirt lot, I saw a gated lot that was clearly marked "Ferry Parking" in Italian, so I walked towards it with the vest guy following and gesticulating next to me the whole time. He peeled off as soon as I walked into the lot and I quickly found an office with a woman sitting inside. I asked her if the vest guy worked for her and she shook her head. "That parking isn't safe. He should not be there." I walked back to my car, half expecting the vest guy to attack me, but he was nowhere in sight. I drove the car into the real lot, paid 18 Euros for three days, and got my real receipt. 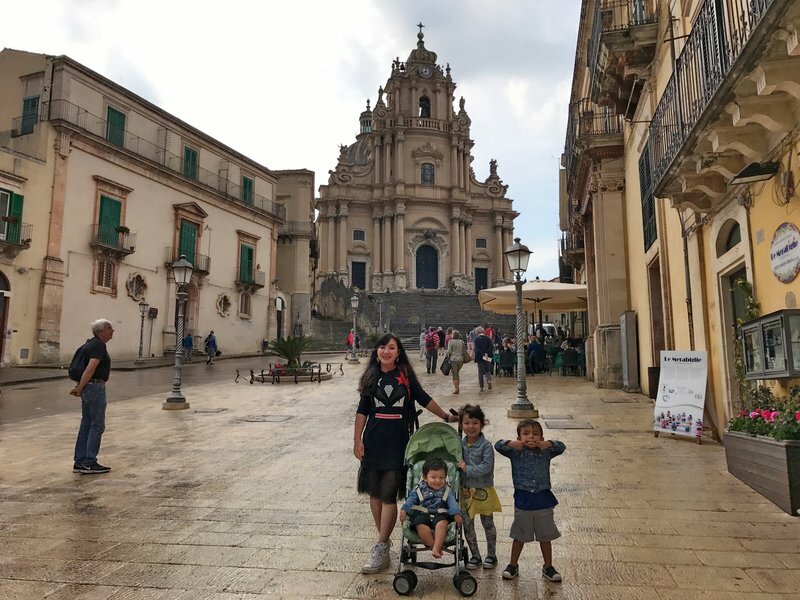 Having foiled my first scam attempt in Sicily, I walked down the hill and joined Mei Ling and the kids just as they started allowing people to board the ferry. We were all about to experience a brand new country. 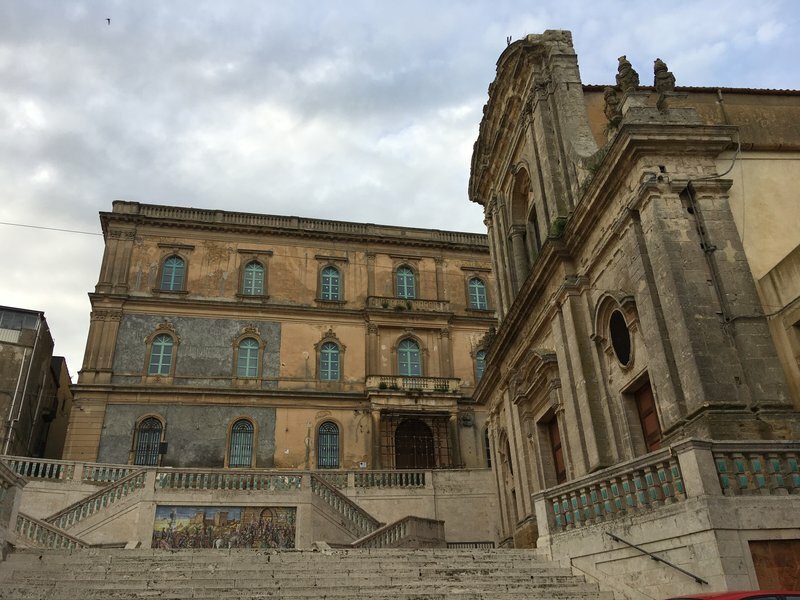 After Taormina, the logical next stop would have been Siracusa, just an hour and a half down the coastal highway. 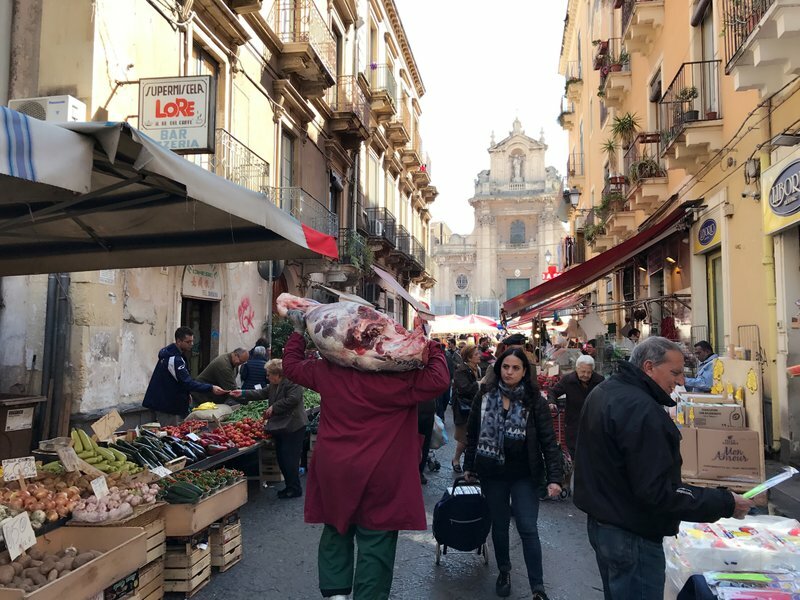 However, the Siracusa market is open every day except Sunday and the Modica market is only on Thursdays, which meant that we had to drive all the way to Sicily's southeastern tip. Markets are a very big deal for us. 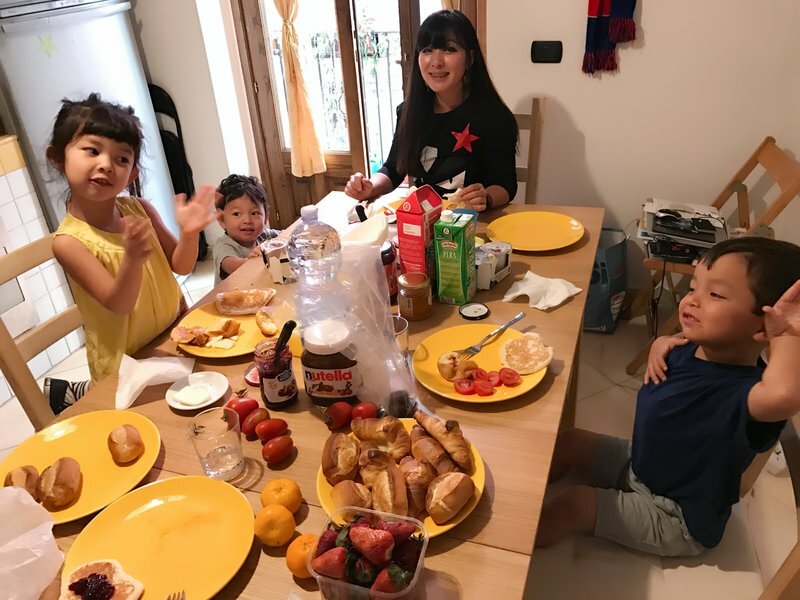 Thankfully there wasn't any traffic and the roads were on low ground so we made it to Ragusa in time for a late lunch. 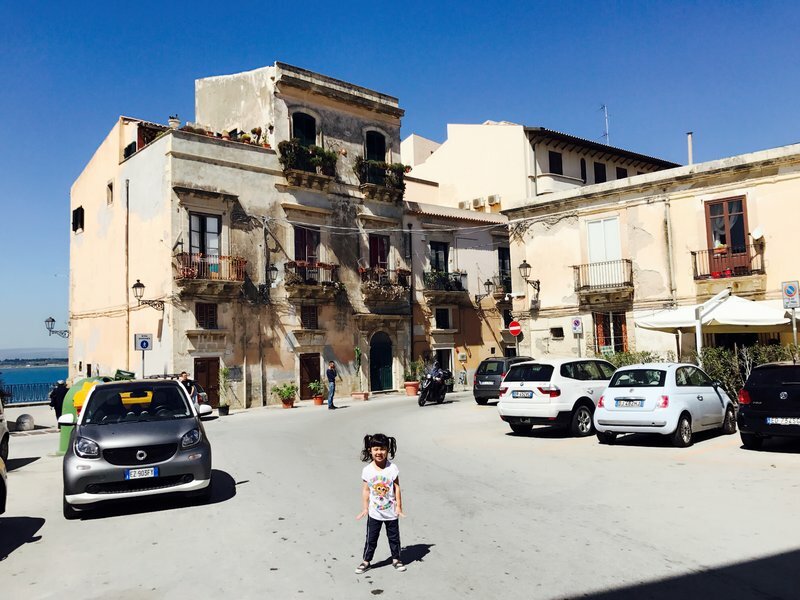 Ragusa is one of four towns in the area renowned for their beauty and Baroque architecture. What is Baroque? I wish I could explain it. As best as I can understand it, it's an architectural style best defined by its era (immediately post-Renaissance) and its ornamental flair. In fact, the word "baroque" has come to mean excessively ornamental or extravagant in style in popular parlance. Having seen examples of Baroque architecture throughout southern and central Europe I have a difficult time describing it, but I know it when I see it. 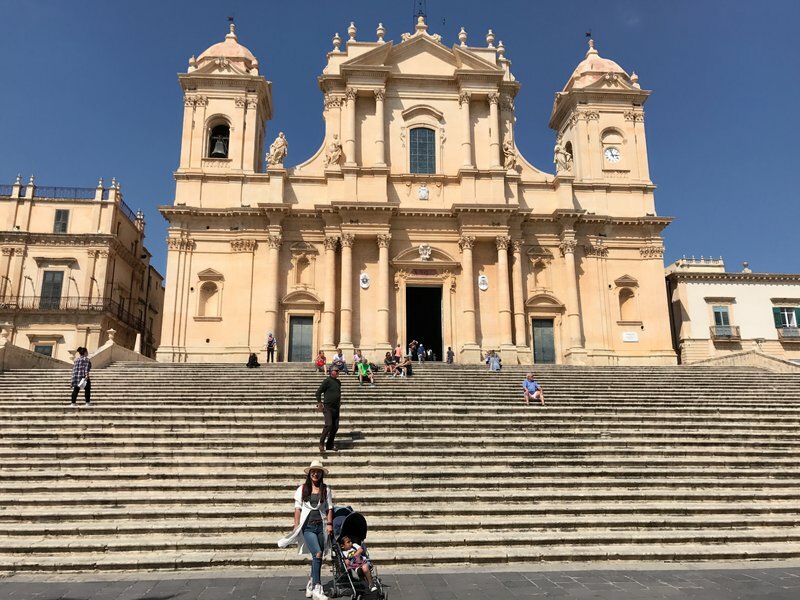 Ragusa's Duomo di San Giorgio is a beautiful Baroque church and brings considerable gravitas to the main square of the old town. 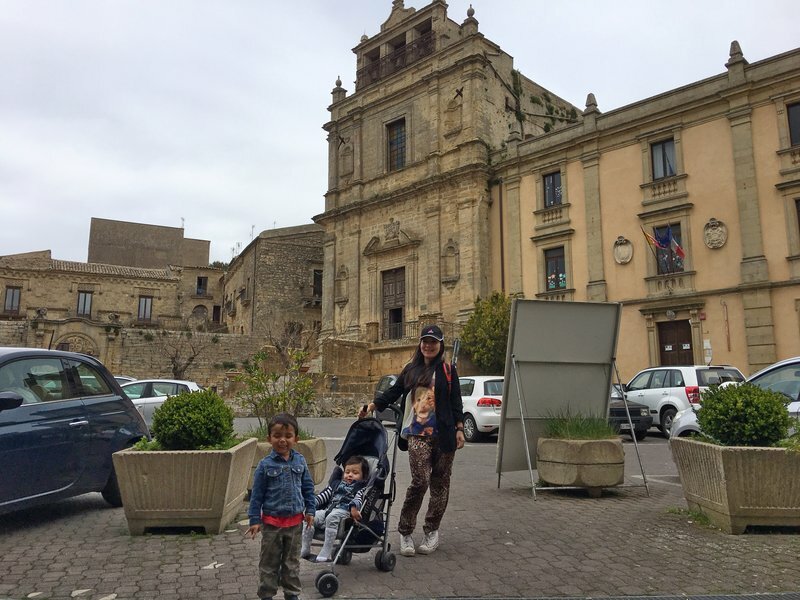 Between our illegal parking spot, the intermittent drizzle, and the long staircase up to the front door of the cathedral we decided to confine our exploration to the main square and an excellent gelateria that inhabited it. 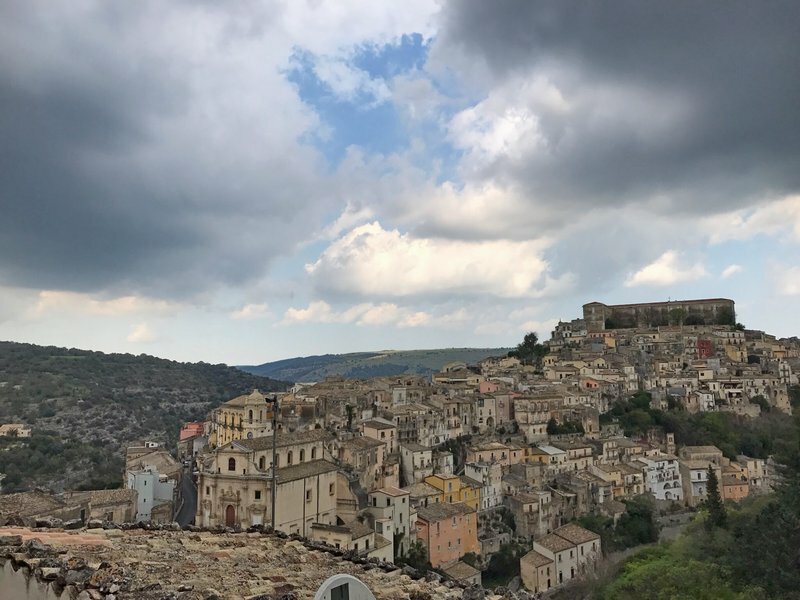 Before leaving Ragusa we drove across the ravine to the upper town Ragusa Superiore for the classic view of the old town. 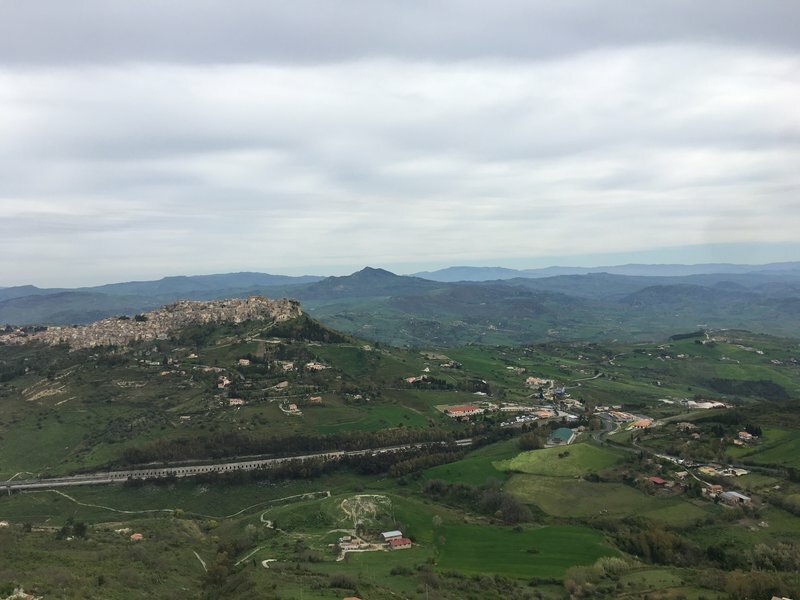 The nearby town of Chiaramonte Gulfi is nicknamed the "balcony of Sicily" for its lofty position on an isolated hilltop and the sweeping views supposedly available from many locations around town. Soon after we arrived at the center of town the skies really began to open up. During one downpour we took refuge in the town's main church where we got to enjoy a choir practice. We braved the rain and explored a few more streets but never found anything close to a view. Eventually we gave up and retreated to our car, with dampened clothes but undampened spirits. It was the only rainout of our trip, so we had little to complain about. 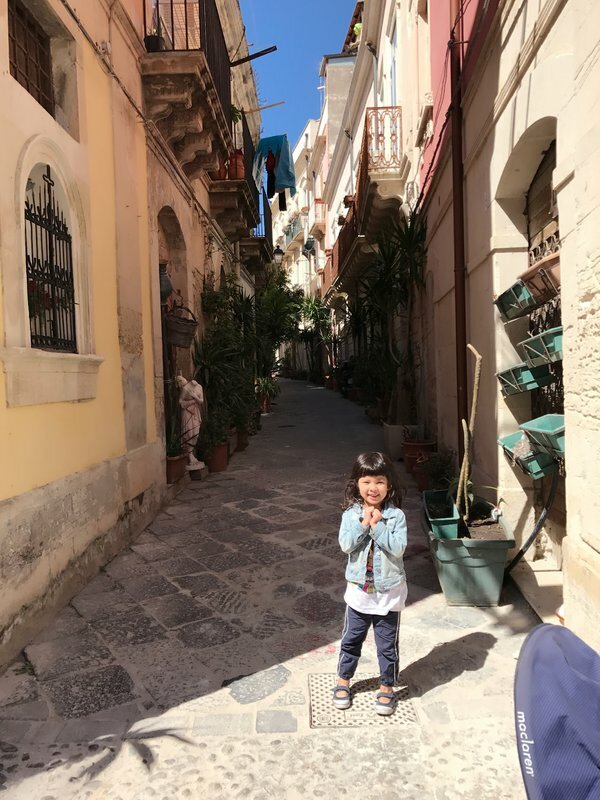 We proceeded to Modica, where we had an Airbnb for the night. 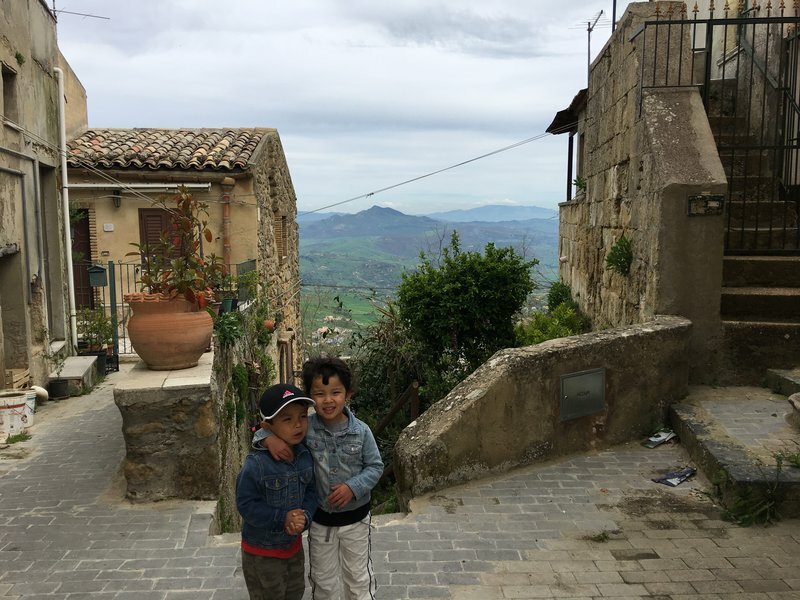 On Via San Benedetto da Norcia, the elevated road that took us to our residential mini-suburb, there was an overlook with amazing views of the old town. The Airbnb was an entertaining place run by an elderly couple who didn't speak a word of English. 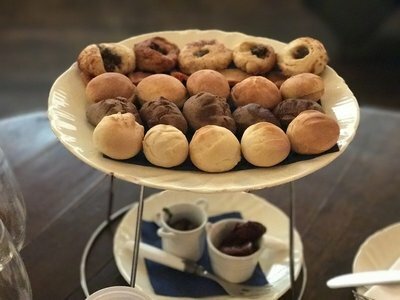 It was one of the few times that my efforts to learn a few words of Italian paid off. 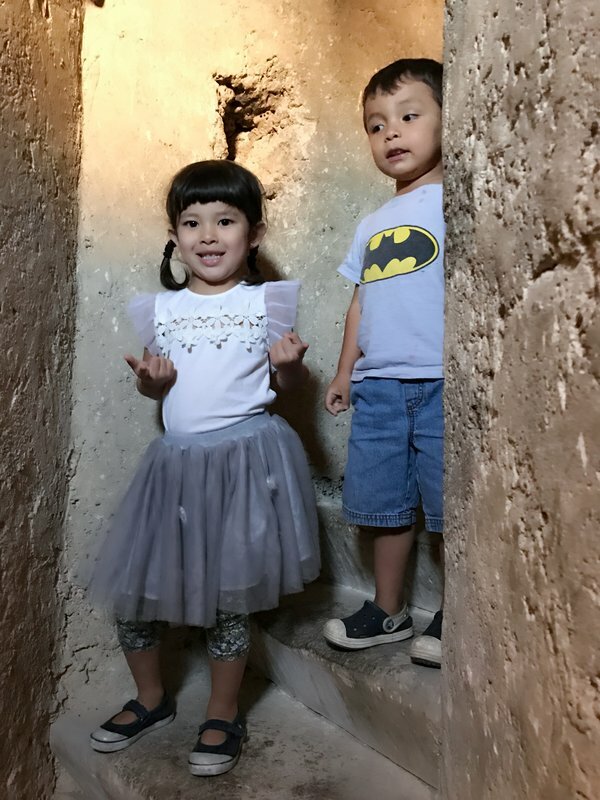 The apartment was filled with fragile tchotchkes and assorted bric-a-brac so we had to incarcerate the kids in the main bedroom the whole time we were indoors. 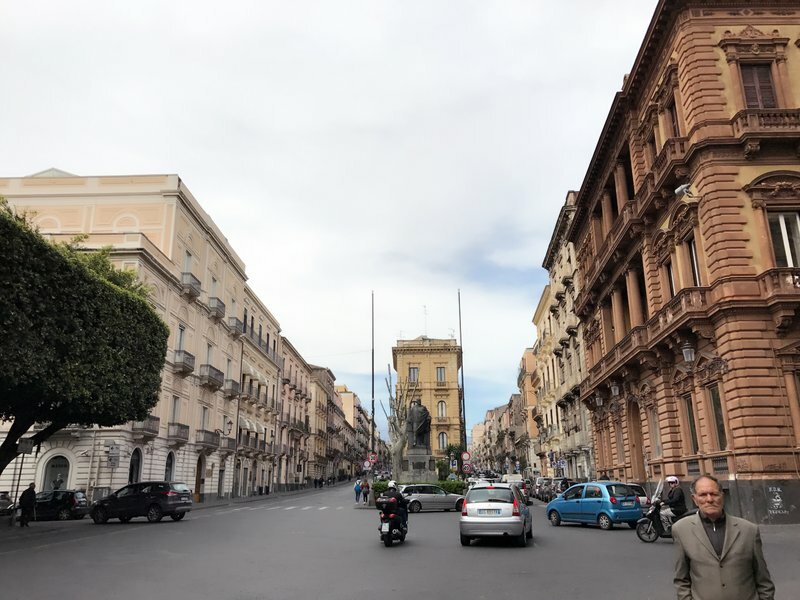 That was motivation enough to get ourselves moving quickly, but there was only time for dinner on the main drag of the old town (unsurprisingly named Corso Umberto I). 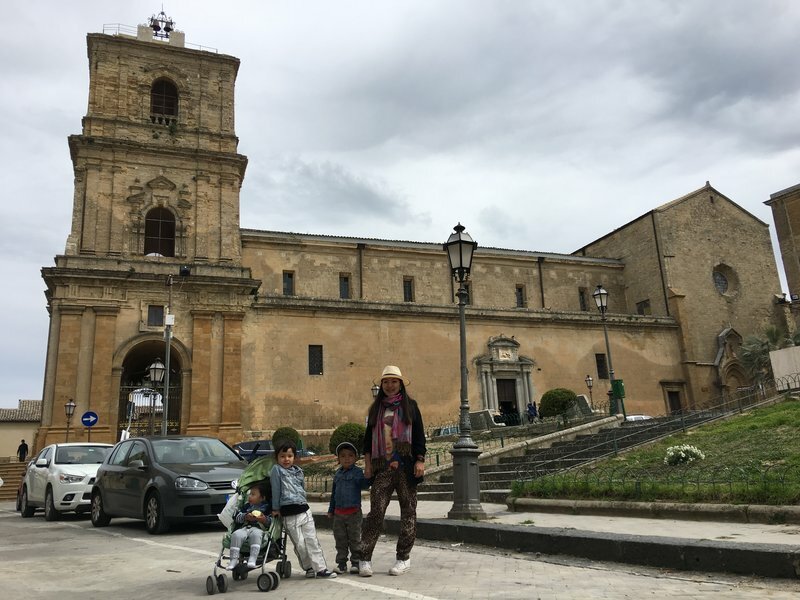 In the morning we were excited to see the Thursday market, which had the annoying habit of moving back and forth between the widely disparate locations of Modica Alta and the Sacro Cruore suburb. 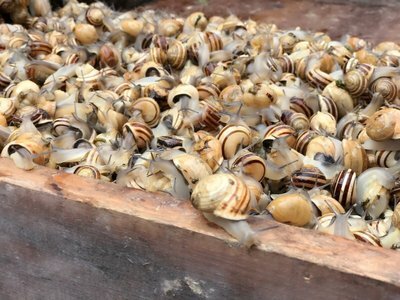 I had researched the expected location of that morning's market and all my inquiries pointed to Sacro Cruore, but twenty minutes of driving around the area revealed nothing. 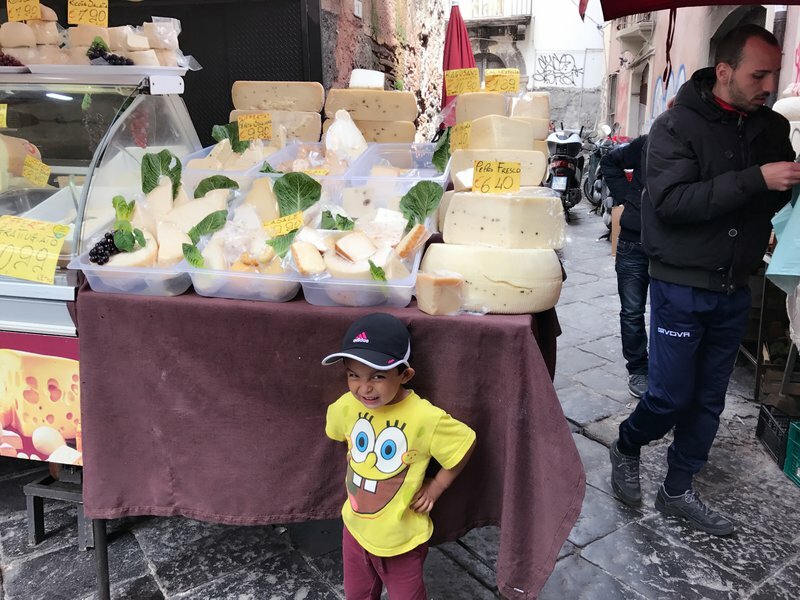 Eventually a solitary vendor informed me the market was actually in Modica Alta that day, so we reversed course and entered that rat's nest of tiny residential streets. 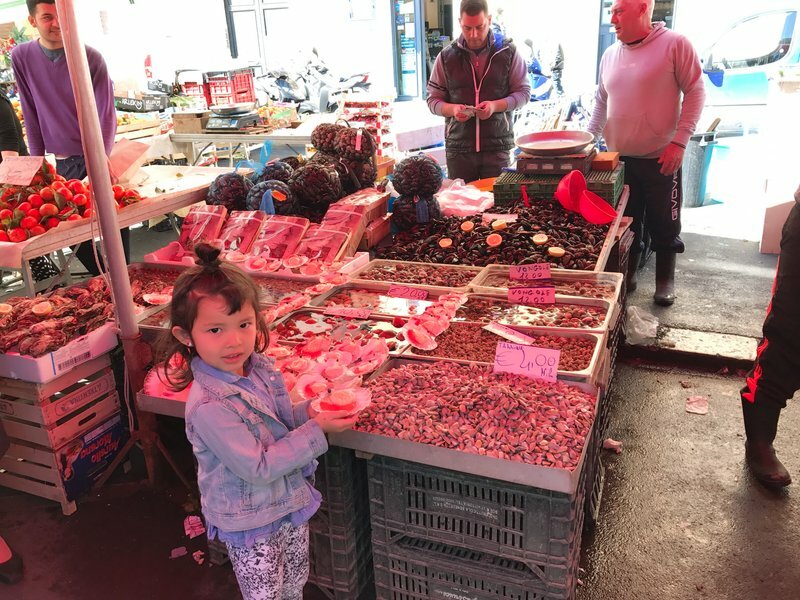 We did find the market, but it was largely focused on clothes and other dry goods and there was very little produce to be seen. 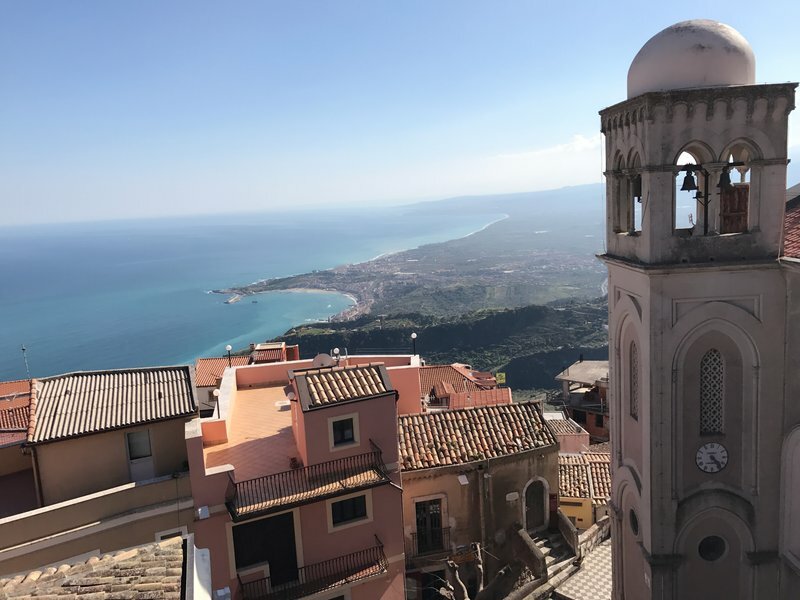 It was quite disappointing, because we had structured our itinerary around the weekly markets in Taormina and Modica and it turned out we shouldn't have bothered. Due to some blocked streets, it was also a mighty struggle to get out of the neighborhood. 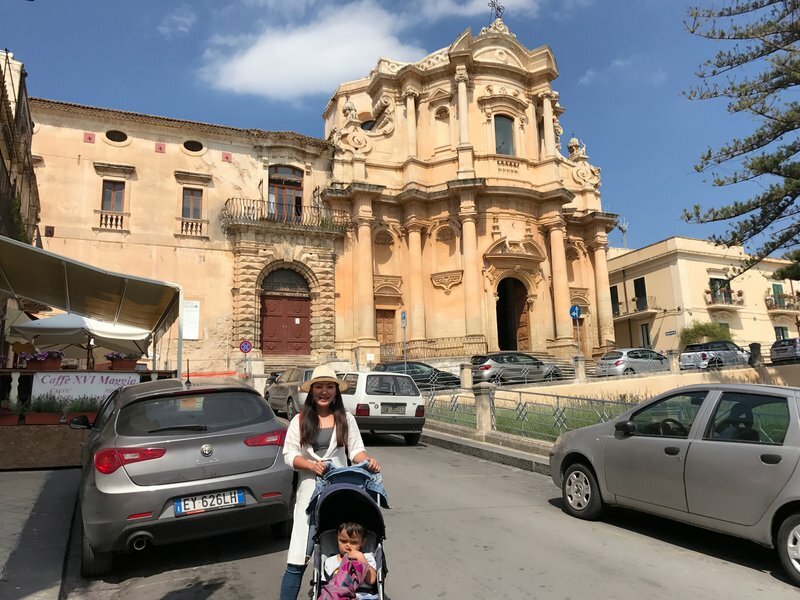 We still hadn't seen the old town of Modica, so we drove back down to Modica Bassa and stopped in front of the main church, Duomo di San Giorgio. 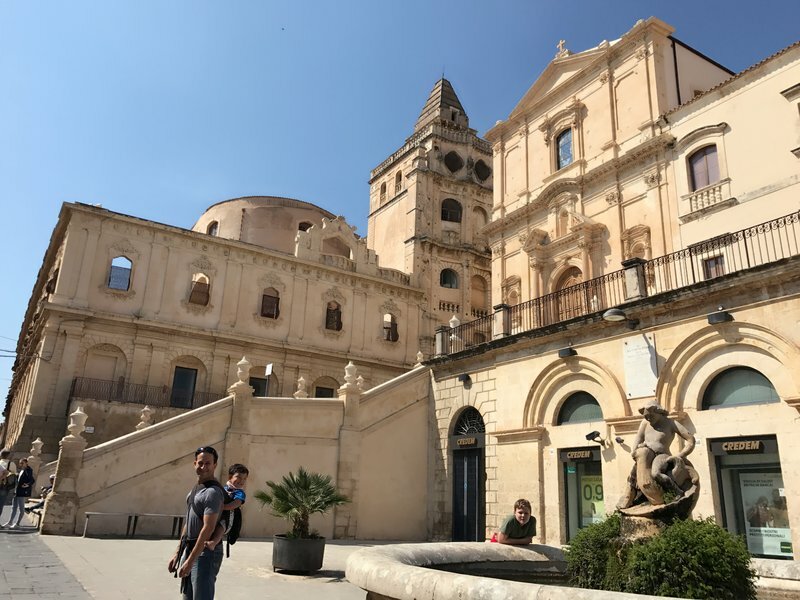 Was it the same Duomo di San Giorgio we had seen in Ragusa, being trucked back and forth between the two cities every day? Probably not, but given the similarity of the facades I wouldn't have been surprised. There wasn't anywhere to park, so Mei Ling and I took turns exploring the immediate surroundings. 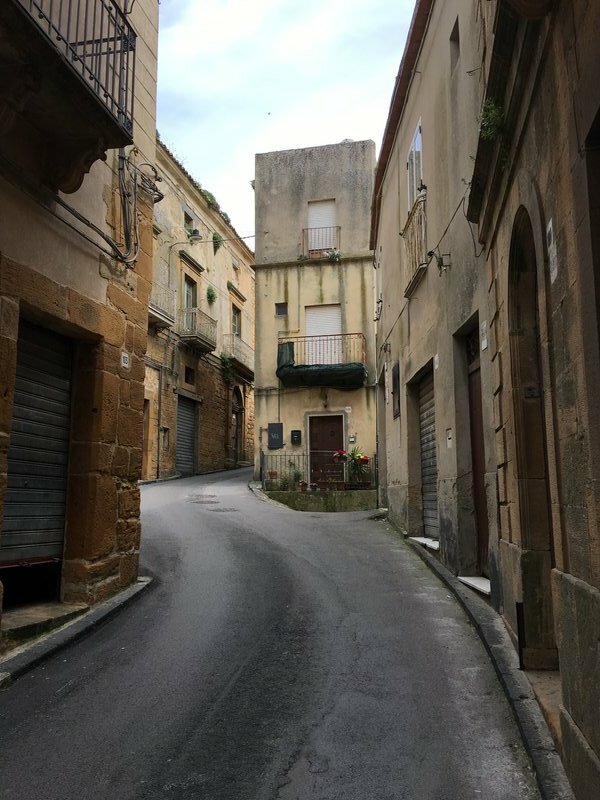 We had a mediocre lunch at the far end of Corso Umberto I, and then headed to Noto. 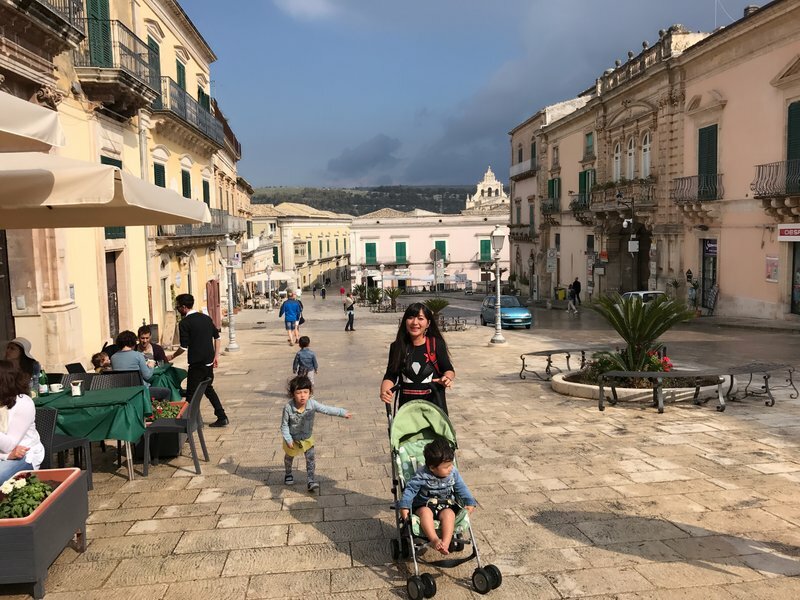 Noto's historic center proved to be much more walkable and impressive than anything we had seen in Ragusa and Modica. It seemed like there was another gorgeous church or palace everywhere we looked. 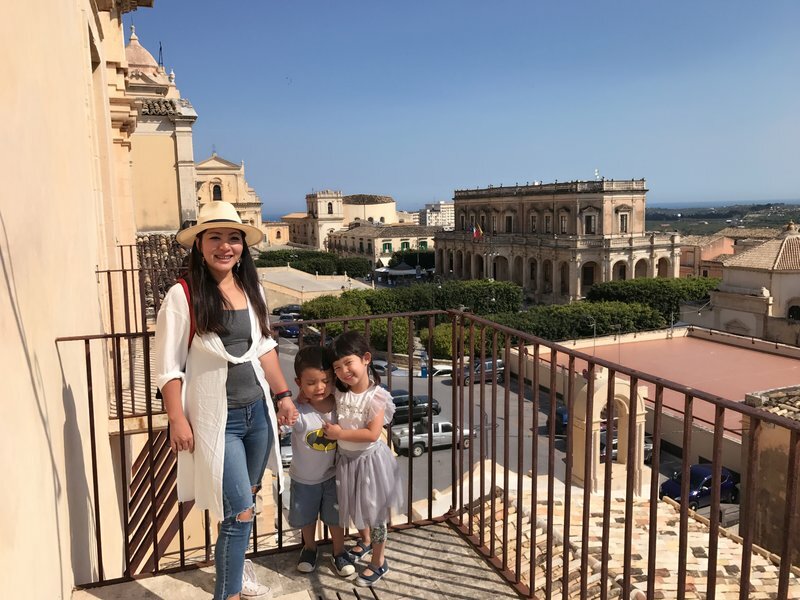 Cleo, Ian, and I climbed the narrow, winding staircase up to the bell tower of Chiesa di Montevergine for views of Noto's cathedral and the rooftops of the old town. 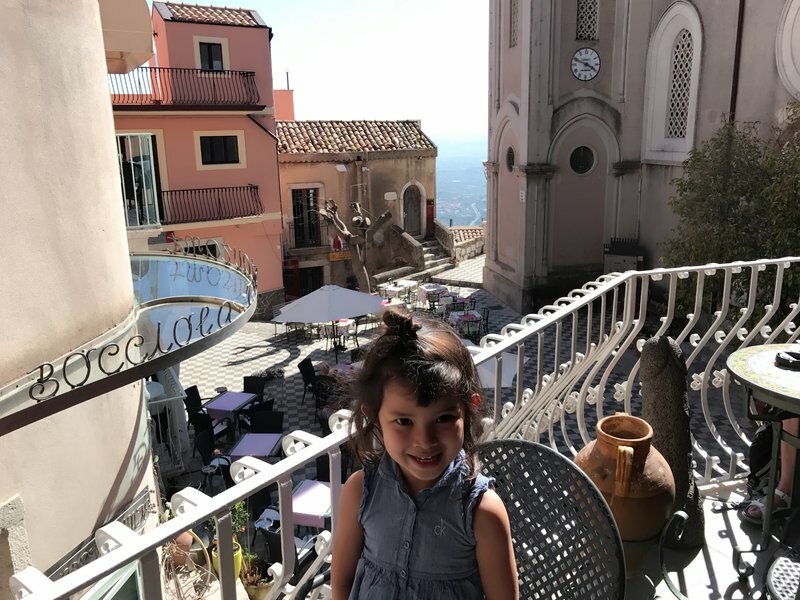 We took a brief tour of the Nicolaci Palace and then stopped at the famous Caffe Sicilia for gelato. 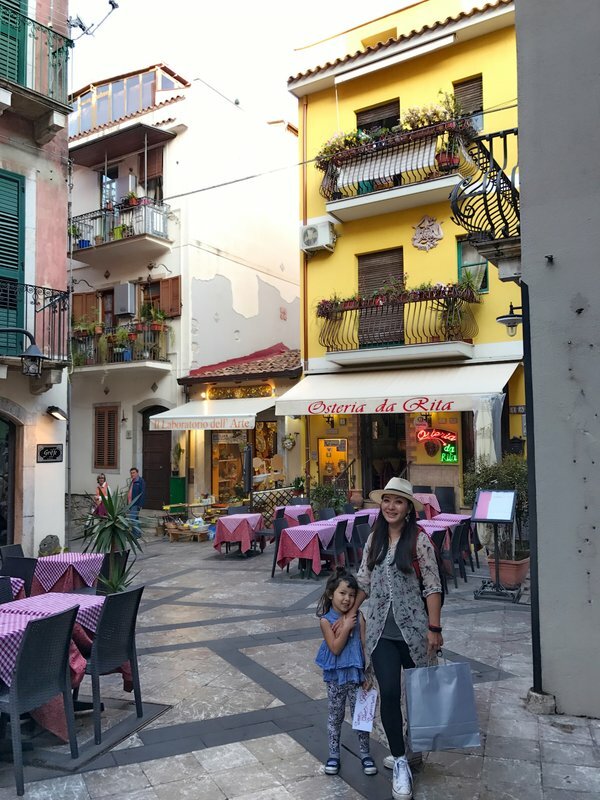 It was nice to be outside on the main street of the beautiful old town, but I couldn't detect any difference between Caffe Sicilia's gelato and any of the versions we'd had previously. Perhaps I'm not cut out to be a gelato connoisseur. 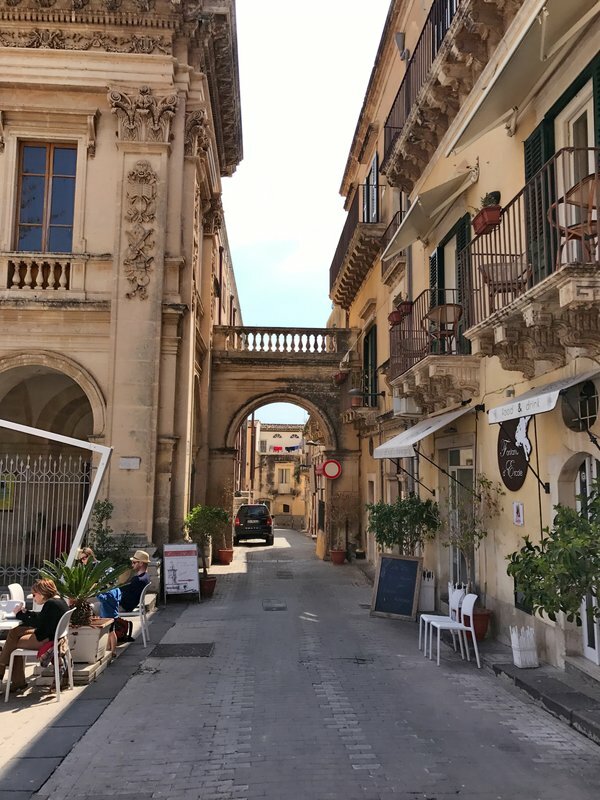 I recorded one last stroll down Corso Vittorio Emanuele with my video sunglasses and then we got back on the road to Siracusa. 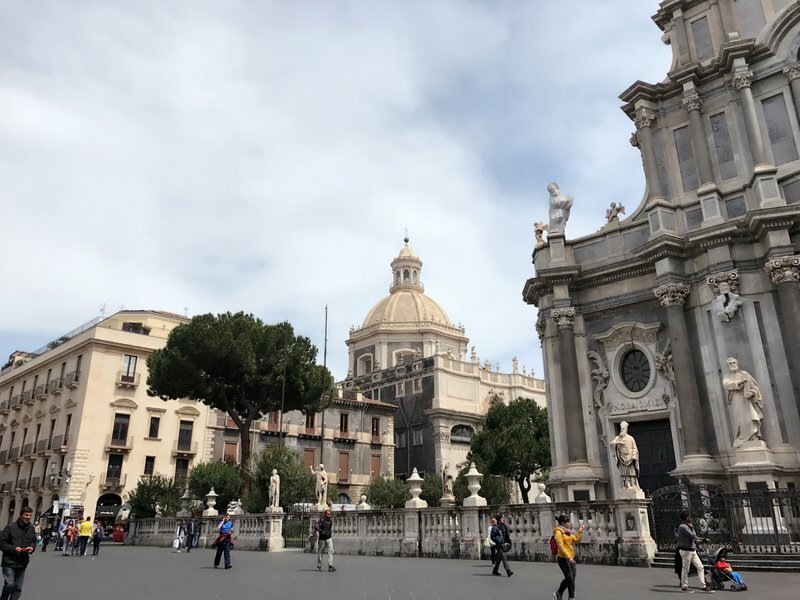 A relative metropolis between the touristic idylls of Taormina and Siracusa, Catania tends to get short shrift from travelers. 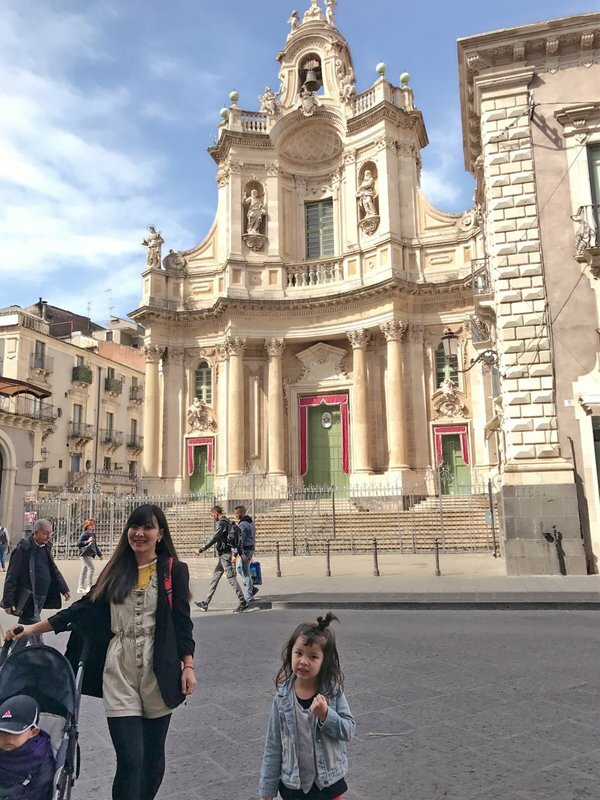 Most visitors to Sicily skip it entirely or make a quick stop to visit the Piazza del Duomo, but for us it was always a high priority destination. 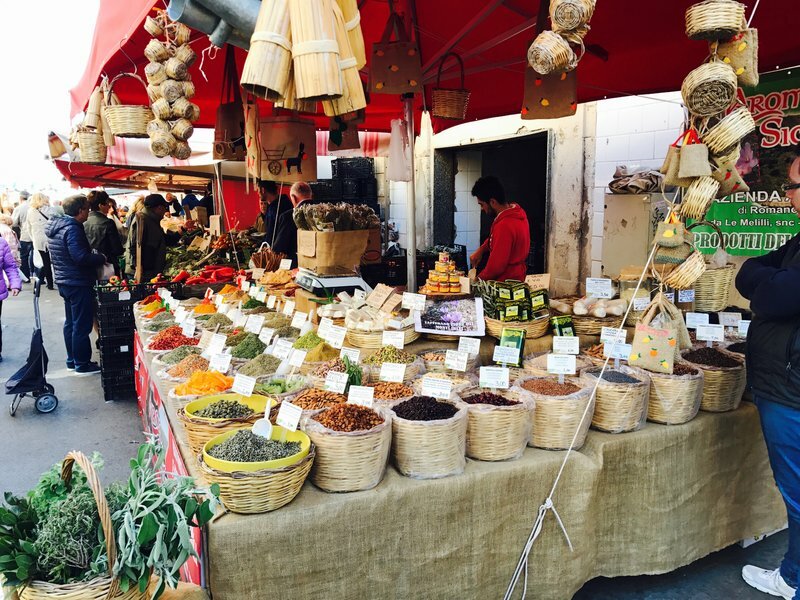 Larger cities usually have the busiest markets, the most crowded streets, and the best-kept secrets. 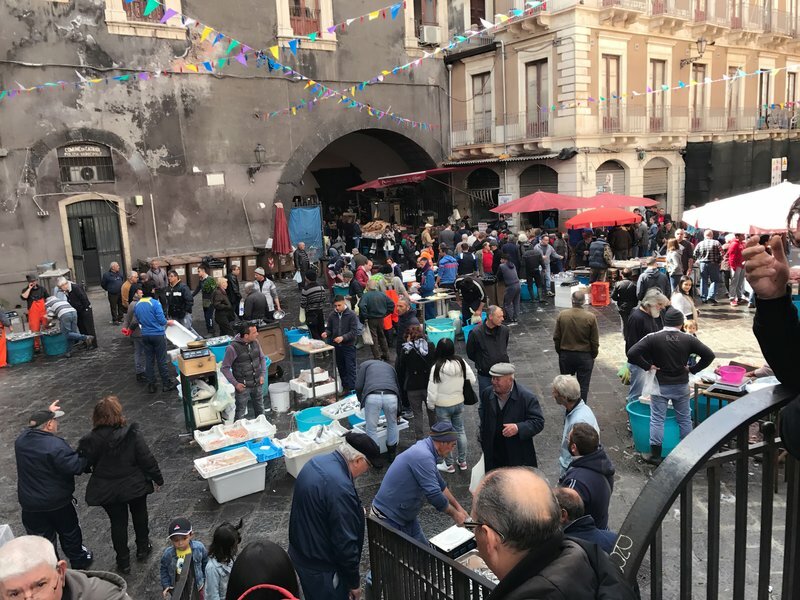 I'd read enough about Catania's markets that even if we found nothing else there worth seeing, we wouldn't have wasted our two day stay. 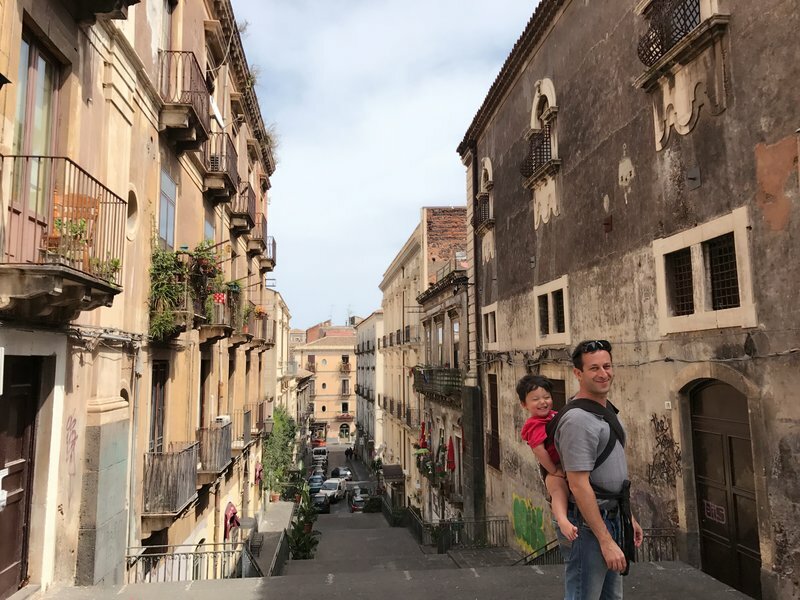 Monday morning we left our Airbnb and walked a few blocks to Via Etnea, the main north-south street of Catania. 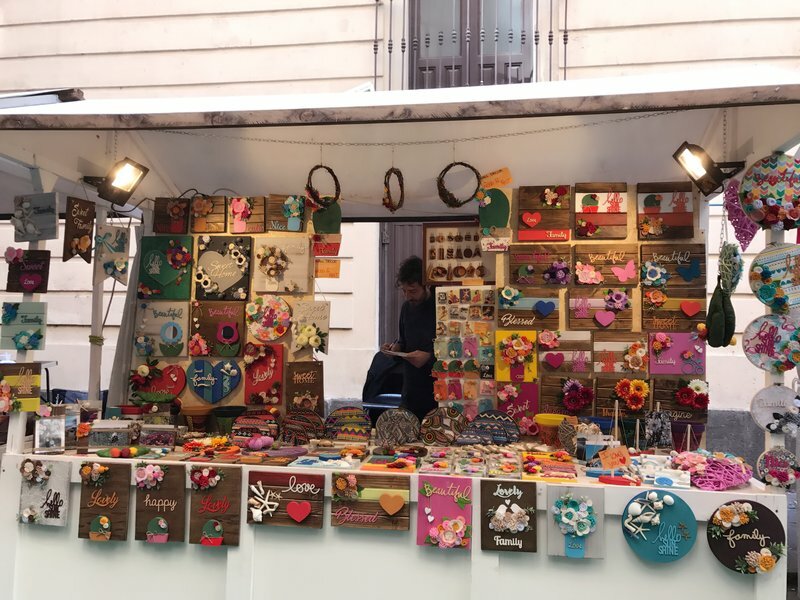 Just that short walk took us through a beautiful square and a crafts market. 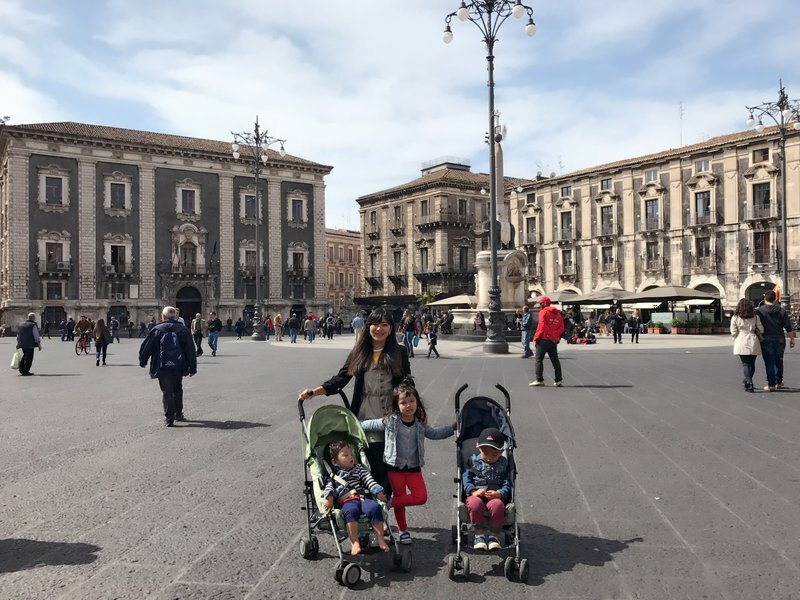 We soon arrived at Piazza del Duomo, which was filled with activity and surrounded by beautiful buildings. 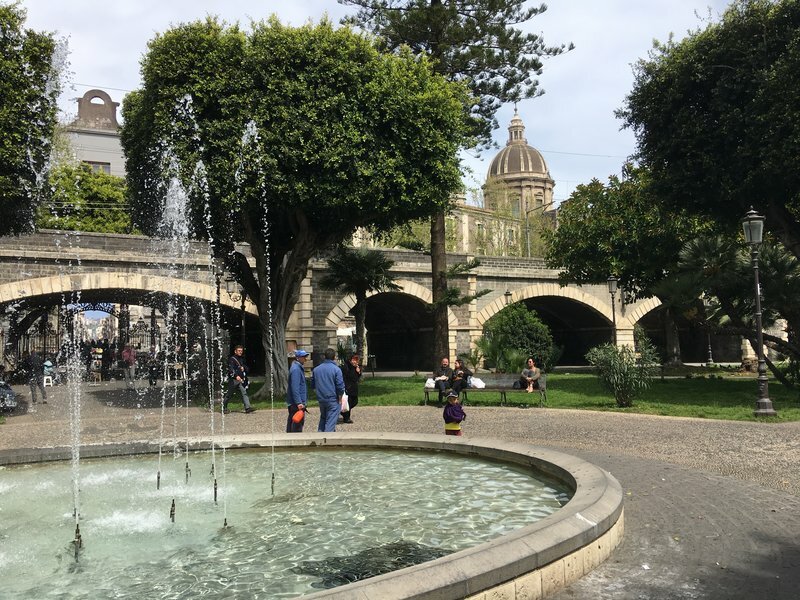 The Fontana dell'Amenano at the southeast corner separates the Piazza from La Pescheria fish market a few steps down. 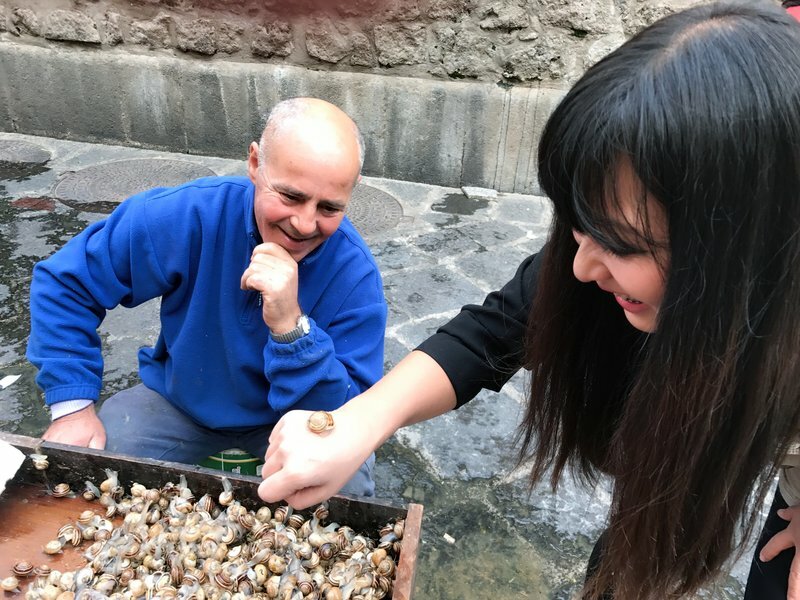 La Pescheria was a bustling fish market, although it was probably a little short of the full complement of vendors on a Monday. 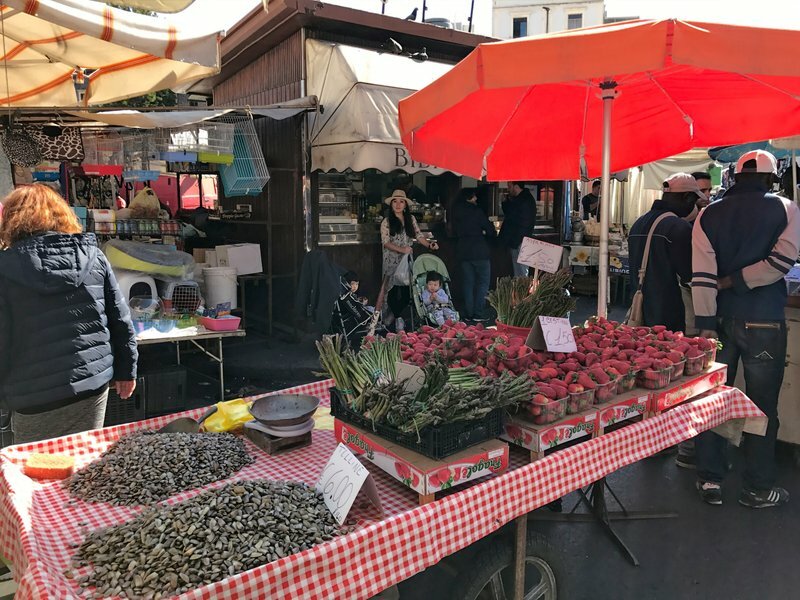 The market was larger than it initially appeared, continuing underneath and behind the buildings that formed the southern perimeter of the square. 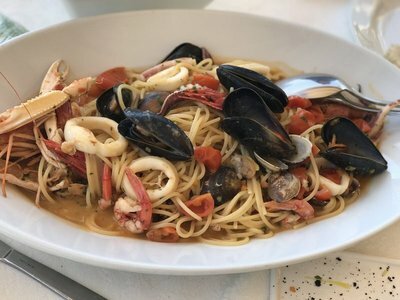 Some highlights were beefy red tuna, golden cross-sections of swordfish, wriggly snails, and transparent baby sardines called neonata that the Sicilians often eat raw with a squeeze of lemon. 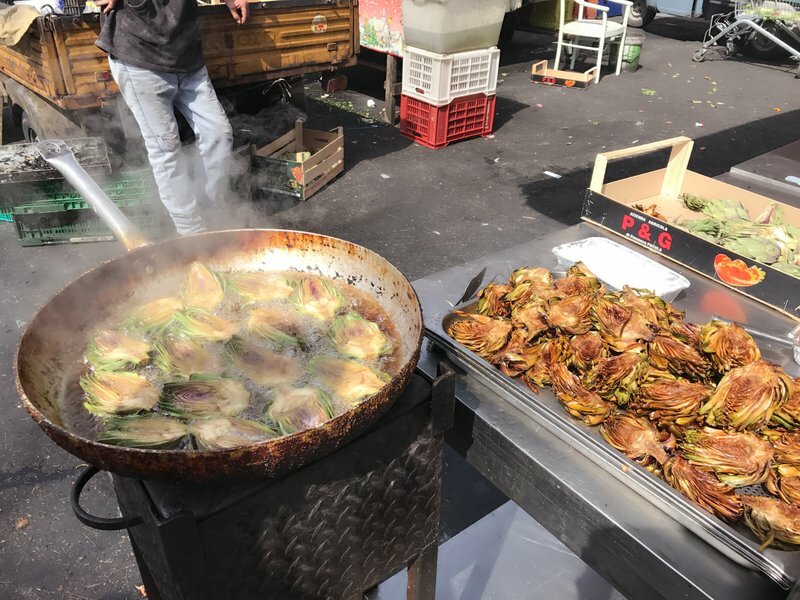 Behind the market we found the only street food stall that day, where they were offering succulent artichokes that had been grilled and deep-fried. 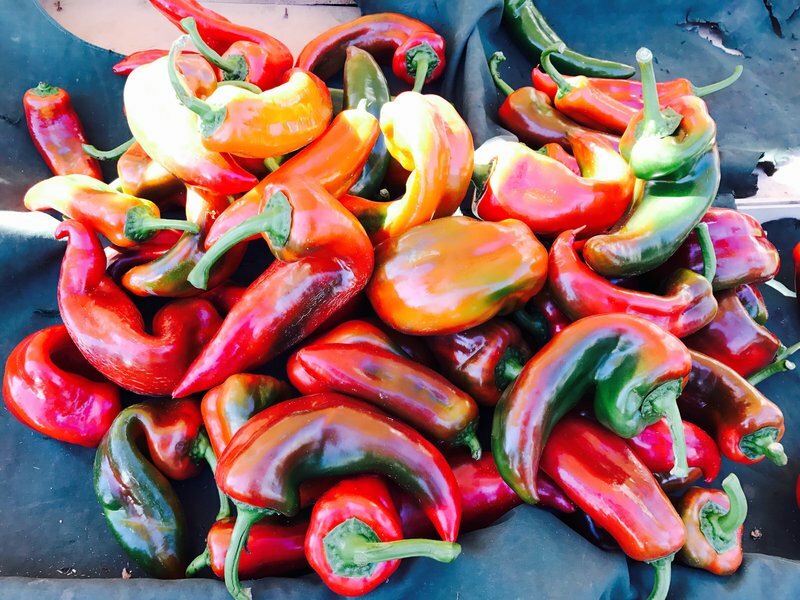 We bought a couple and ate them in the tiny park across the street. It was still early for lunch so we walked back through the rear half of the fish market. 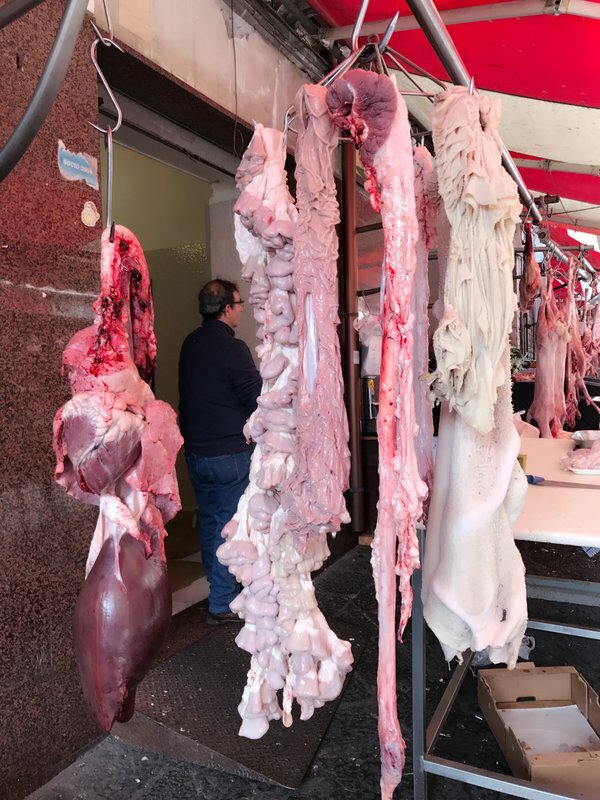 On the adjacent streets of Via Pardo and Via Zappalà-Gemelli we found produce vendors and a line of butchers. 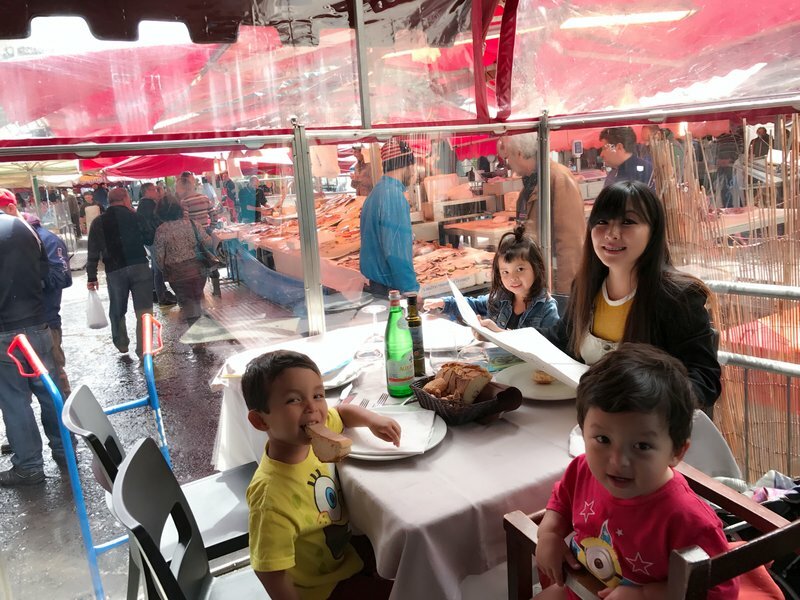 By this time, the restaurant we'd been eyeing for lunch had opened so we got ourselves a table on the patio with a prime view of the market. The food didn't exactly blow us away but the atmosphere couldn't be beat. 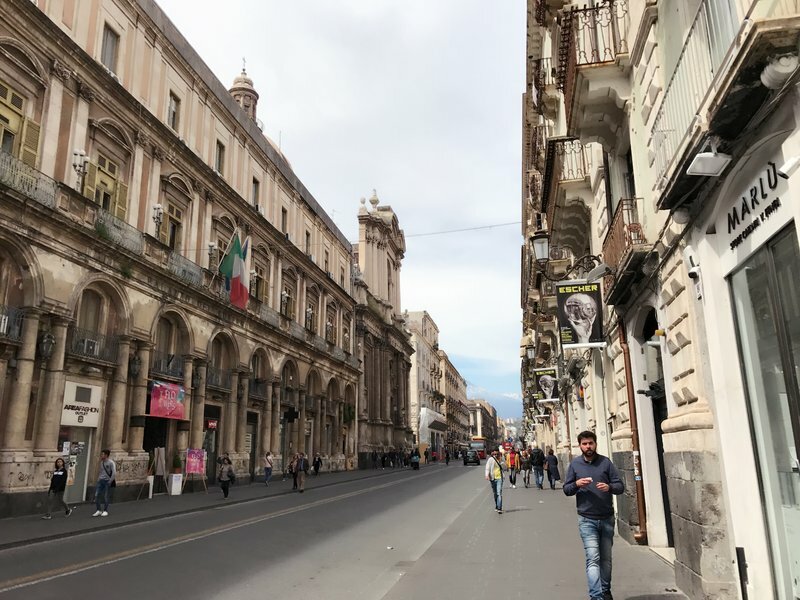 We walked north up Via Erasmo Merletta, parallel to Via Etnea, and almost immediately ran into the lovely campus of Università Degli Studi Di Catania. We were on a steep slope here, so each street to the west was higher by a floor. This gave the campus a very interesting three dimensional feel. 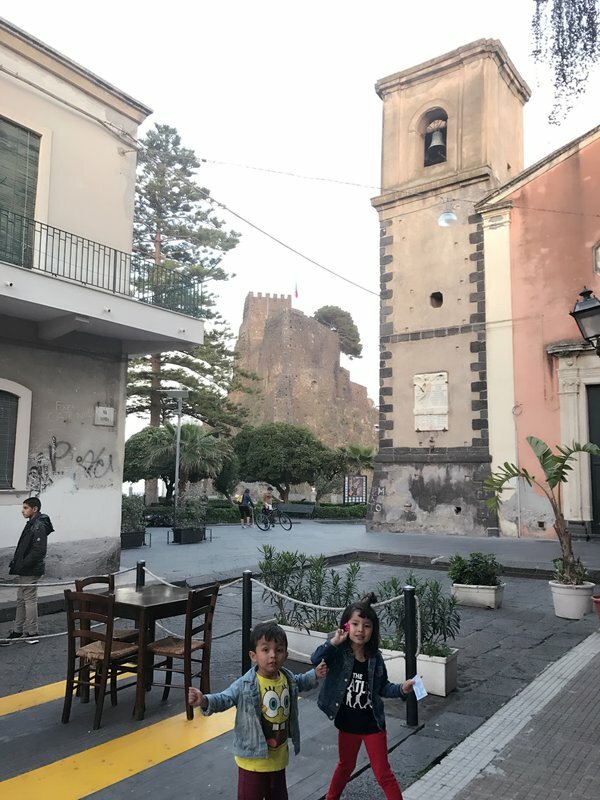 We found our way back to Via Etnea and kept heading north with our eyes on the legendary volcano that gave the street its name. The busy boulevard was lined with cafes and boutiques. 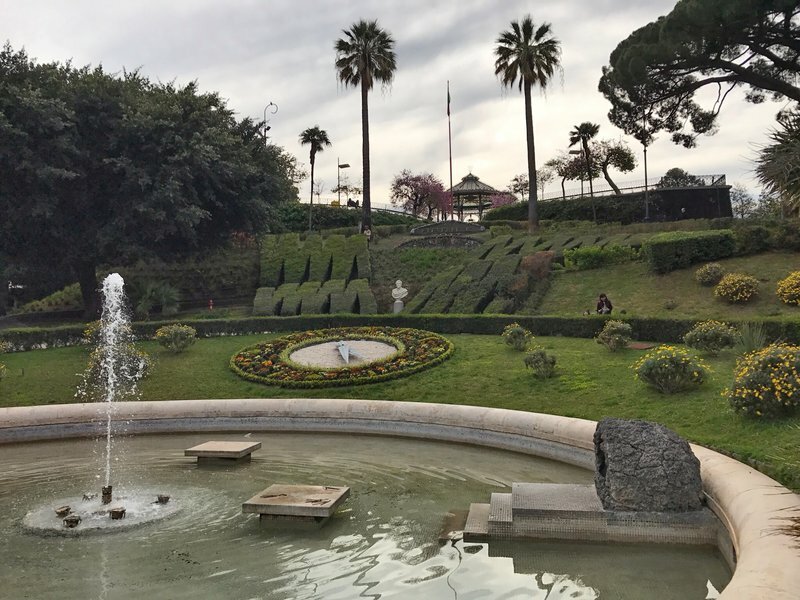 Eventually we reached the beautiful Giardino Bellini, whose immaculately manicured greenery rose up the same east-west incline we had explored earlier at the university campus. 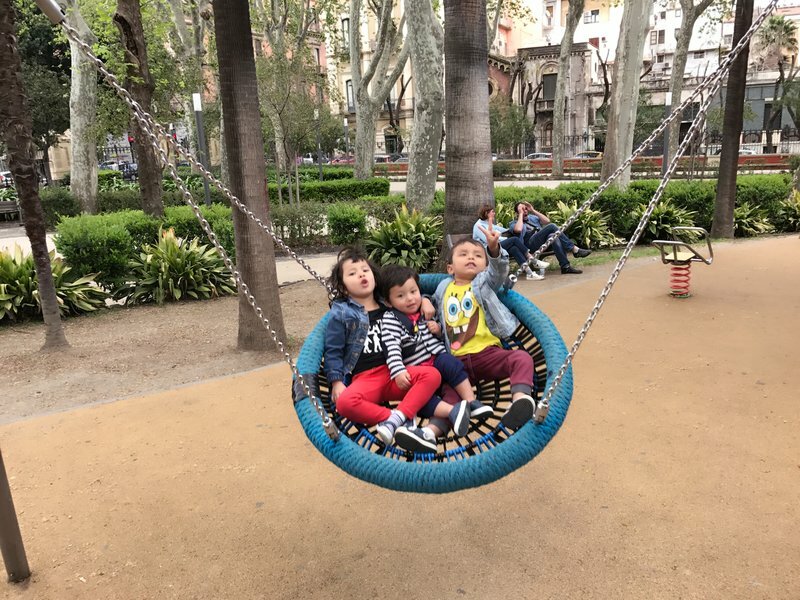 The kids were all awake at this point and got to shake off the cobwebs of their afternoon naps in the park's busy playground. 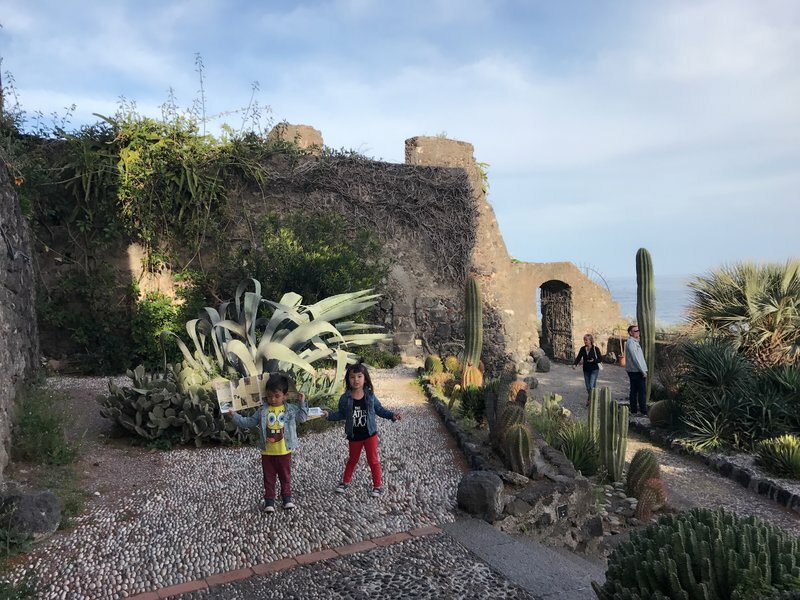 It was only mid-afternoon when we were done with the park and there wasn't anything left to do in Catania until dinner, so we decided to drive up the coast to Aci Castello instead. 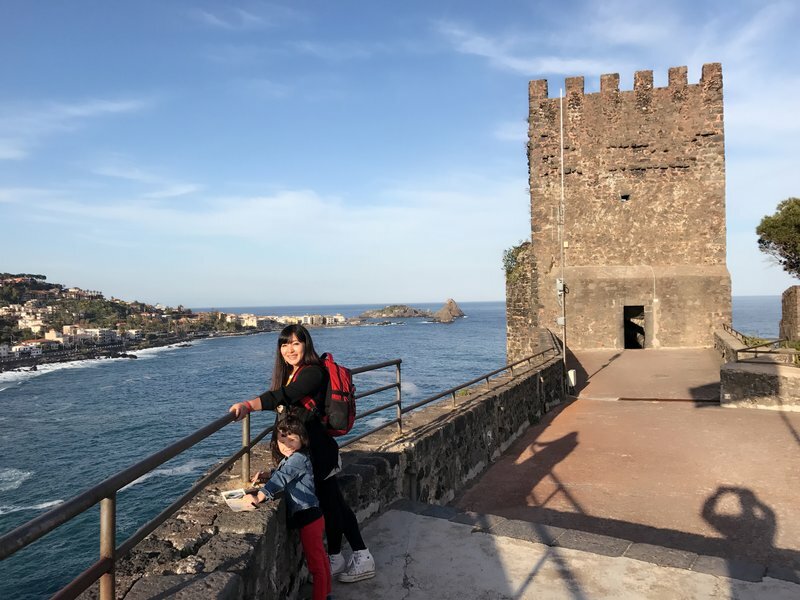 I'd planned Aci Castello as a stopover on the way to Taormina the next day, but getting it done that day instead meant we would be getting to Taormina a lot earlier and would open up our whole schedule. 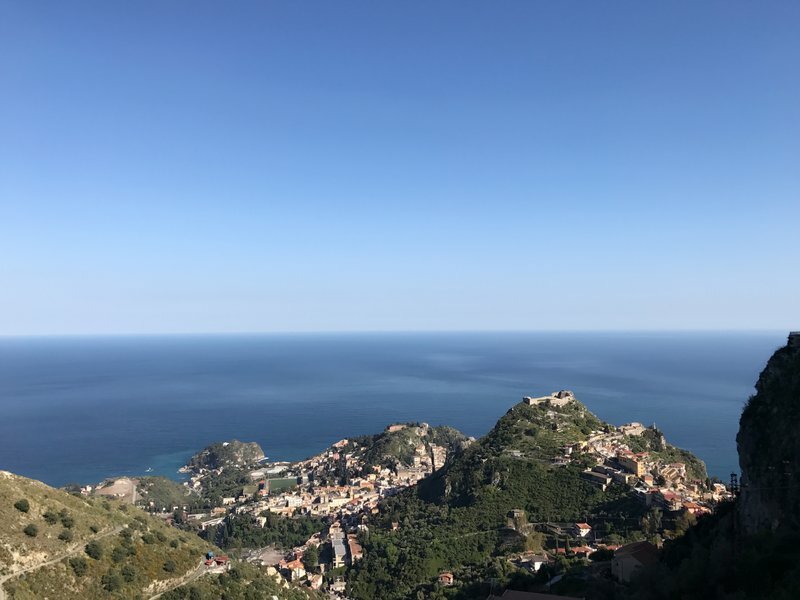 The drive to Aci Castello was only six miles but the coastal road was jam-packed and glacially slow. 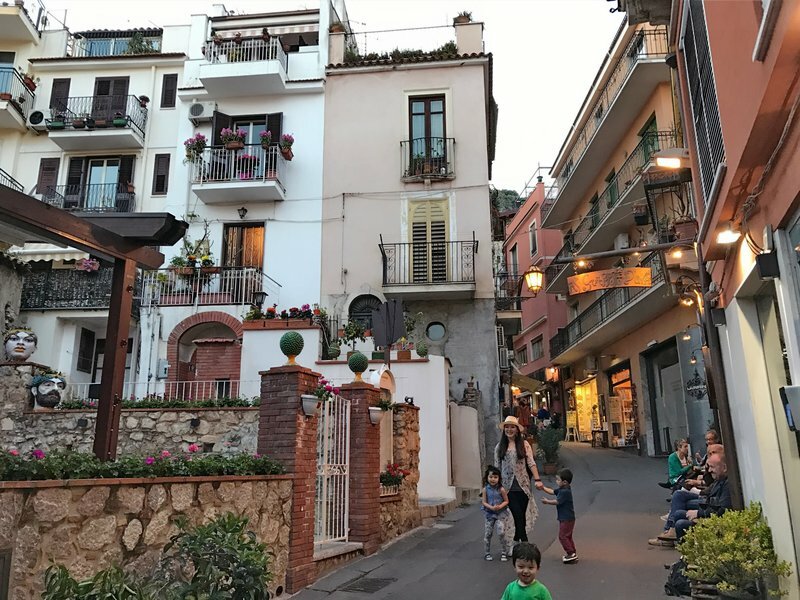 The tiny seaside town was a charming hive of narrow streets. 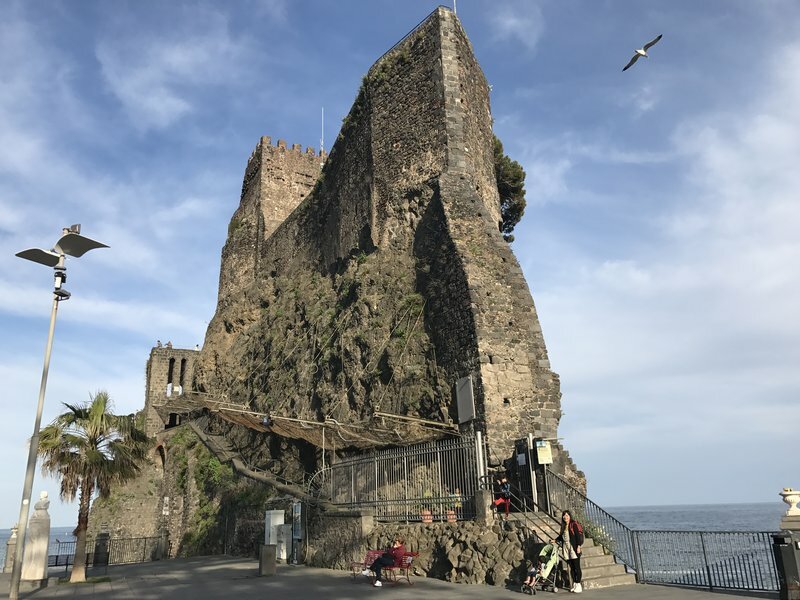 The castle was a remarkable, improbable wedge of stone built into a lava outcropping on the water's edge. Intentionally or not, the front of the castle looked like an enormous boat driving into the land. 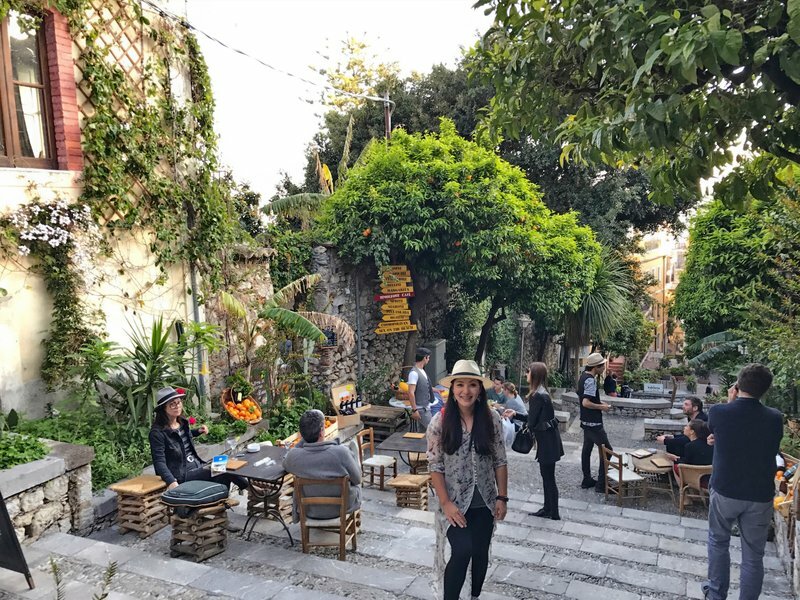 The levels above contained a beautiful cactus garden and terraces with views of the town and coastline. 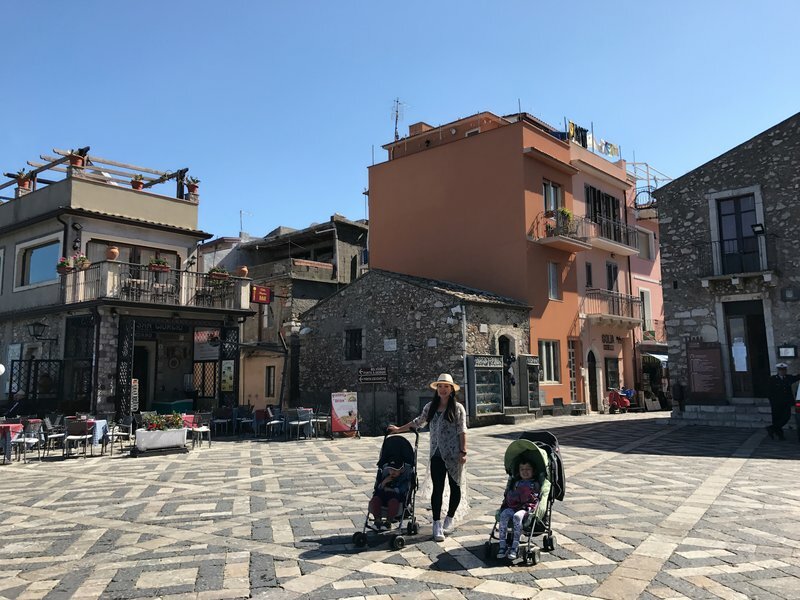 We walked for a short time through the largely-deserted old town near the castle and then stopped in a restaurant to get pizza for the kids and Nero d'Avola for ourselves. 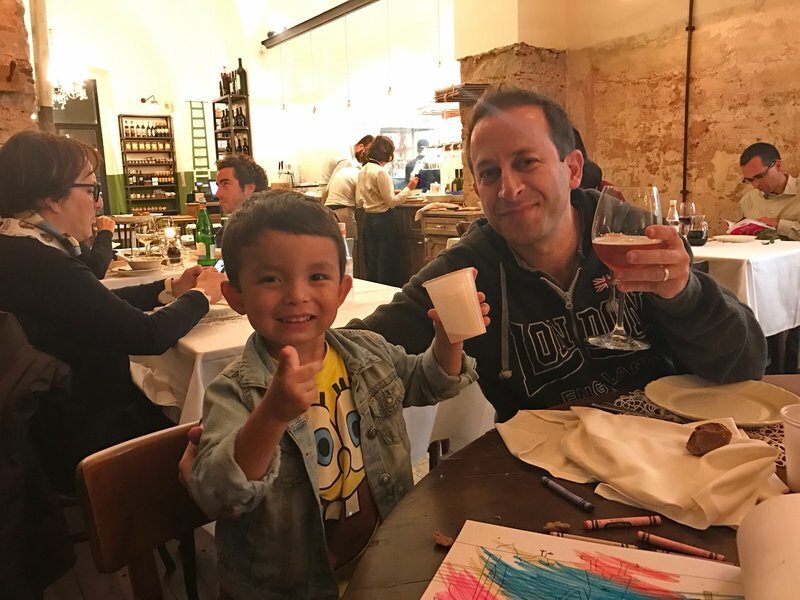 Back in Catania, we had a pleasant dinner at Me cumpari Turiddu, a hip restaurant downtown with good beer and decent if unmemorable food. 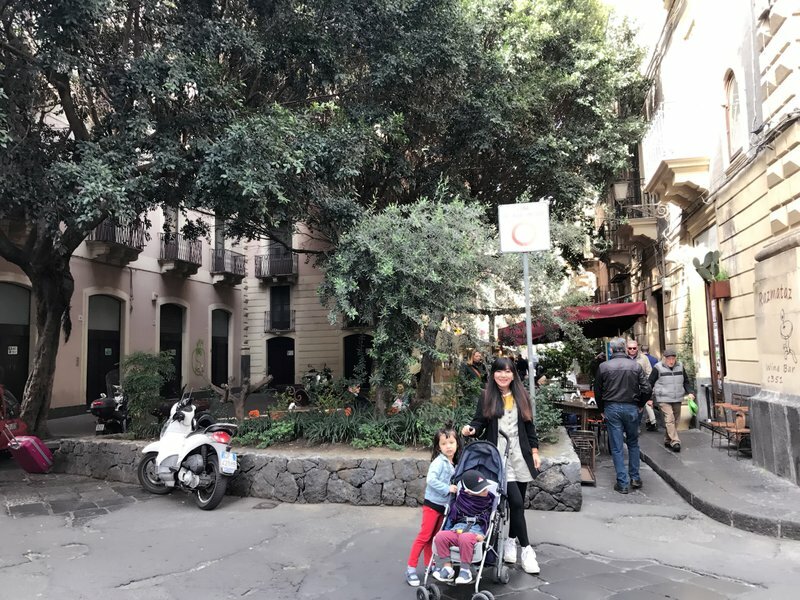 Tuesday morning we packed up the car and then walked a couple of blocks north to Fera 'o Luni market in and around Piazza Carlo Alberto. 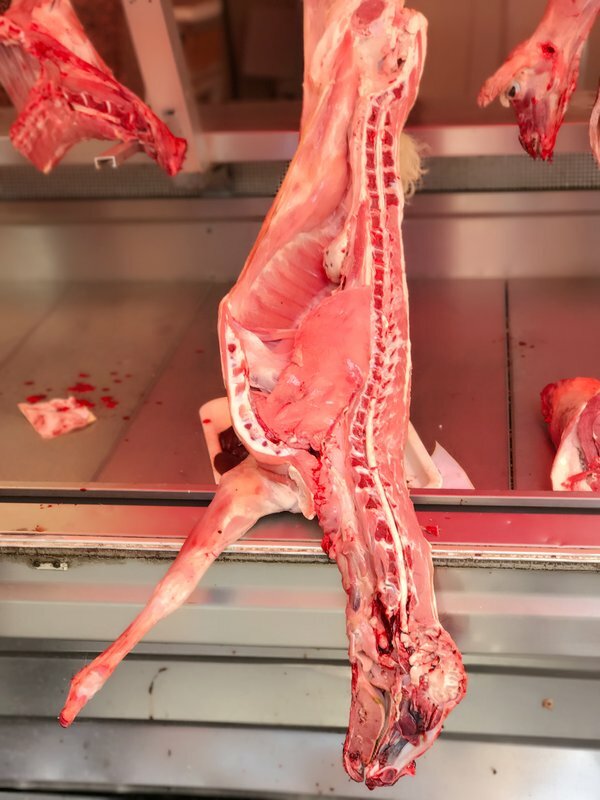 The market was so large that at first we had some trouble finding the meat and produce section. 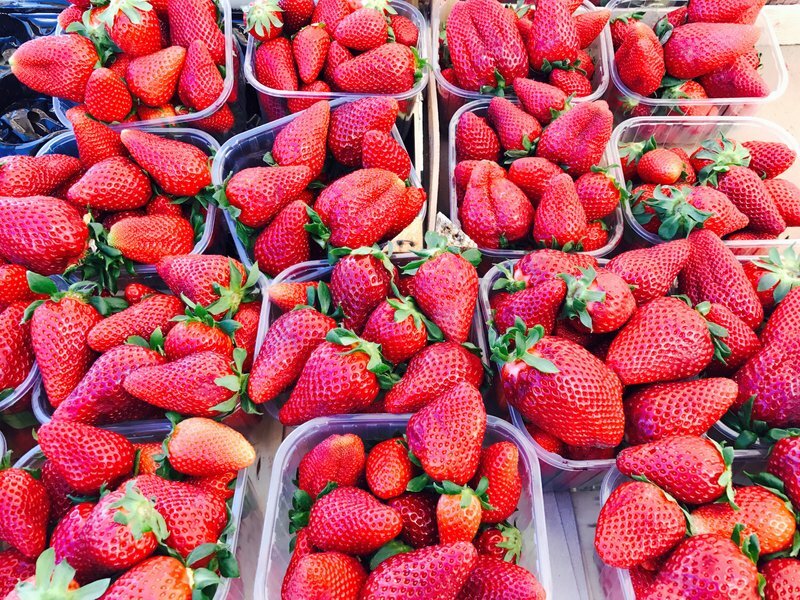 Then we suddenly came upon an enormous mound of gigantic, deep red strawberries and I knew that we were home. I bought a kilo and they were the best we had tasted up to that point. 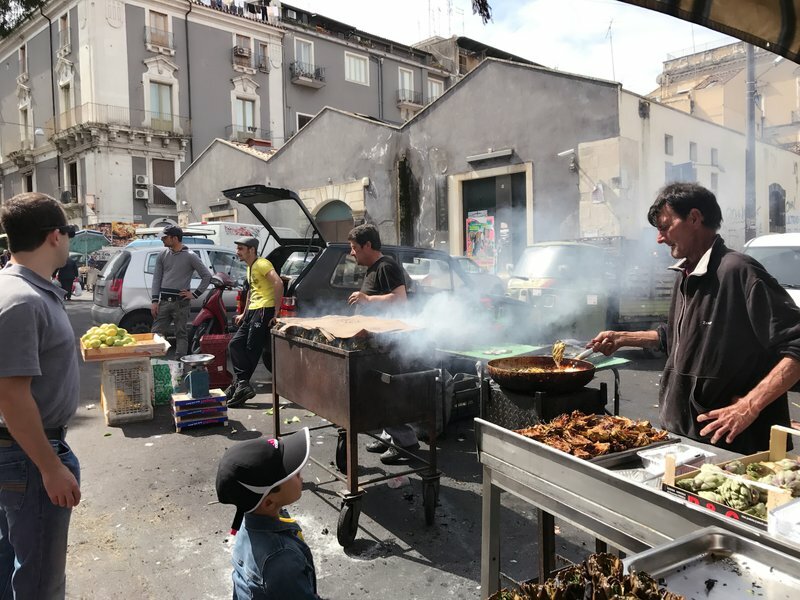 After a few minutes walking through the extensive food market, I decided Fera 'o Luni was even better than Ballarò in Palermo. 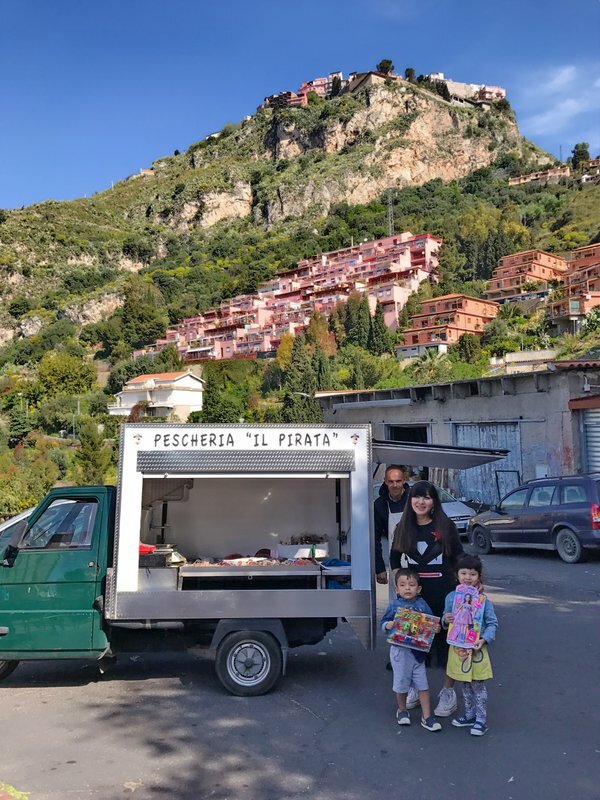 There weren't many seafood vendors, which was unsurprising considering that La Pescheria market was just a ten minute walk away. 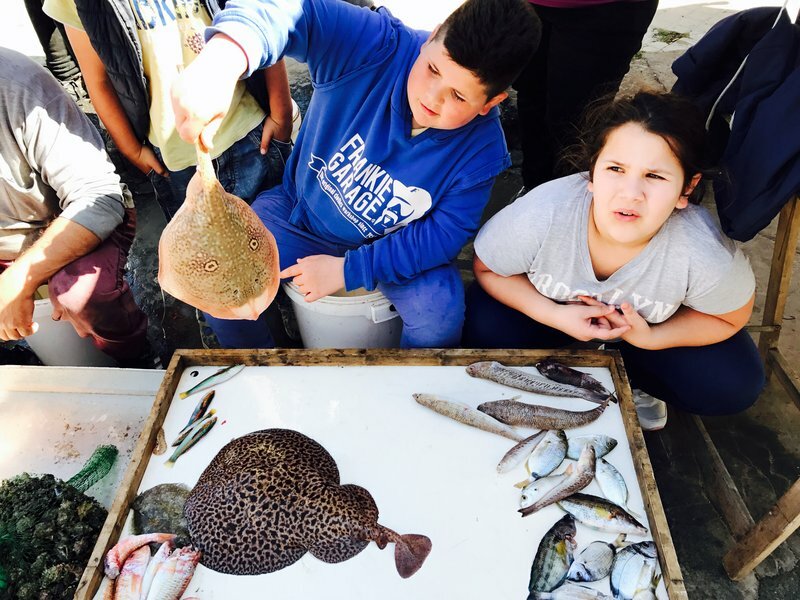 The kids found the one shellfish stall to be very entertaining. 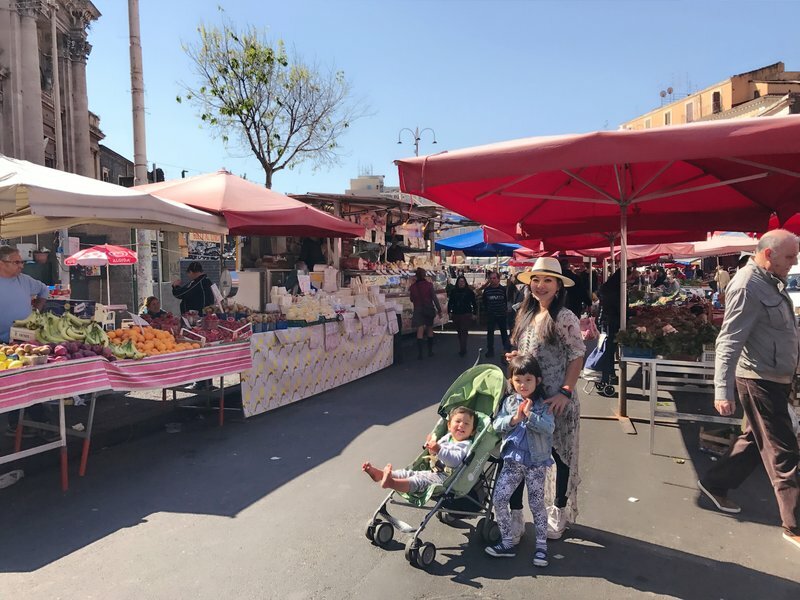 It was a good thing we had arrived early because the market soon became too crowded to move comfortably with the strollers. 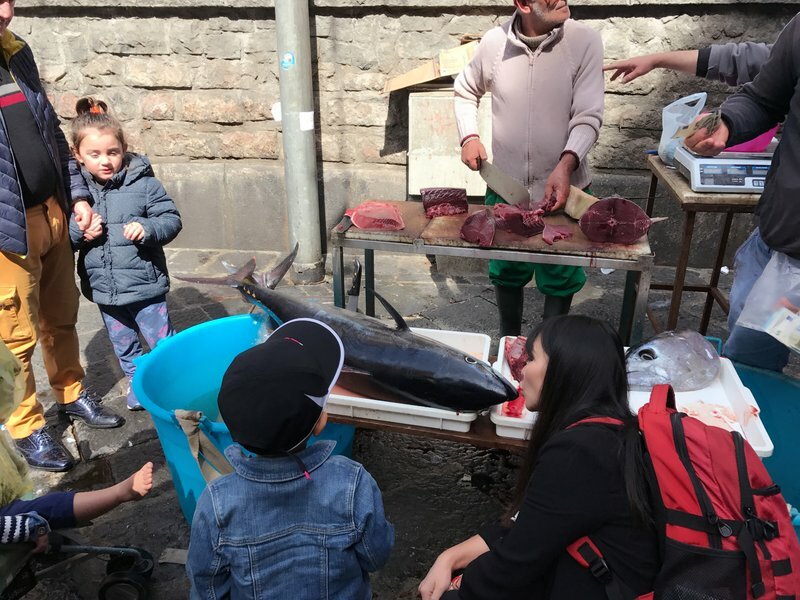 We spent an hour enjoying the atmosphere in the side streets around the market, and then headed back to the car. 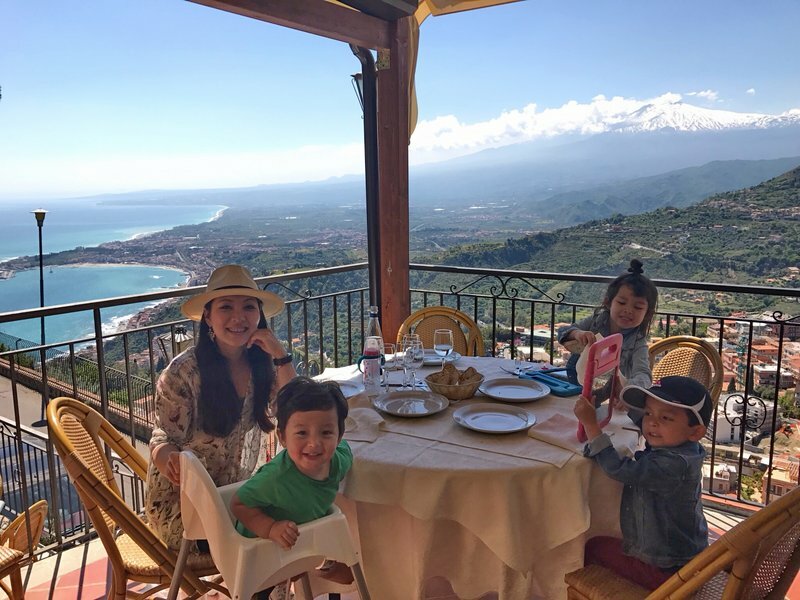 Our goal was to be in Taormina for lunch. 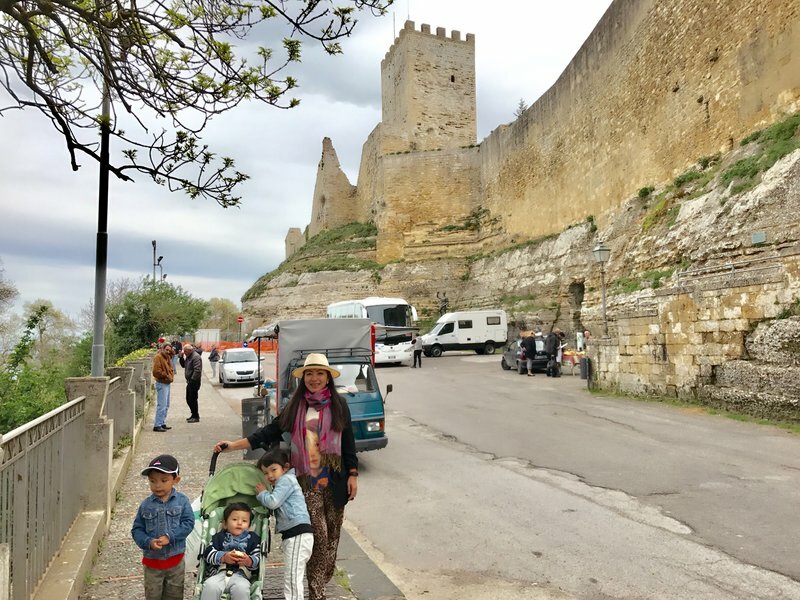 After departing the coastal highway, we arrived at Castelbuono fairly quickly. 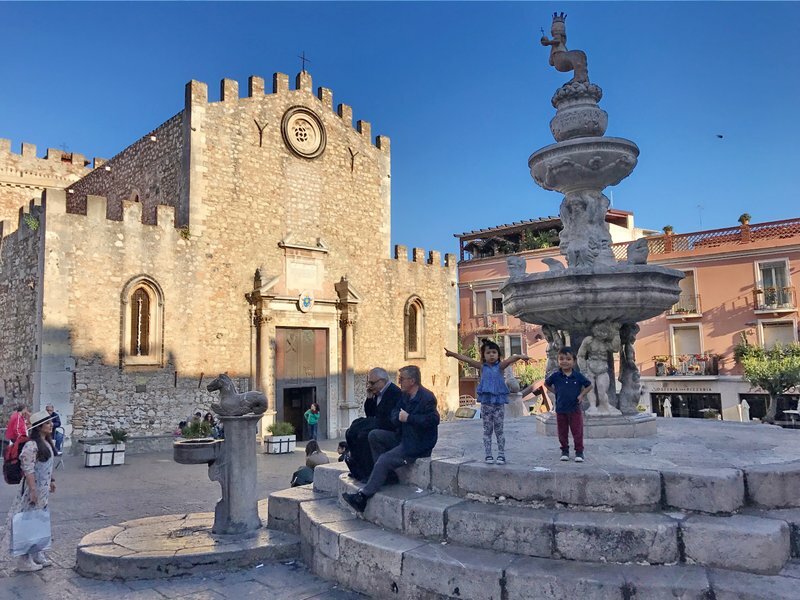 I had planned a quick stop to see the Castello dei Ventimiglia and perhaps have lunch in the adjacent piazza, but our impromptu meal in Cefalù had rendered the lunch issue moot. 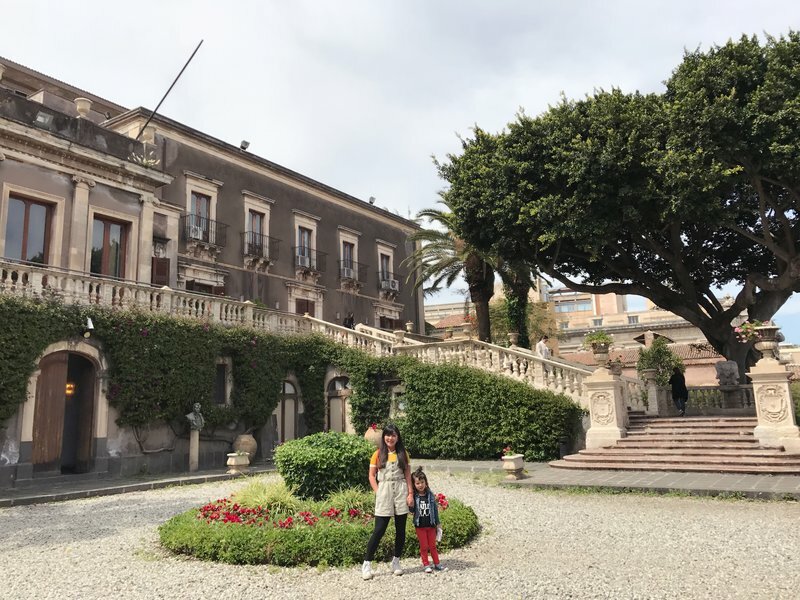 Instead, we took a quick look at the exterior of the foreboding castle and then walked down the charming main street of the old town to Piazza Margherita. 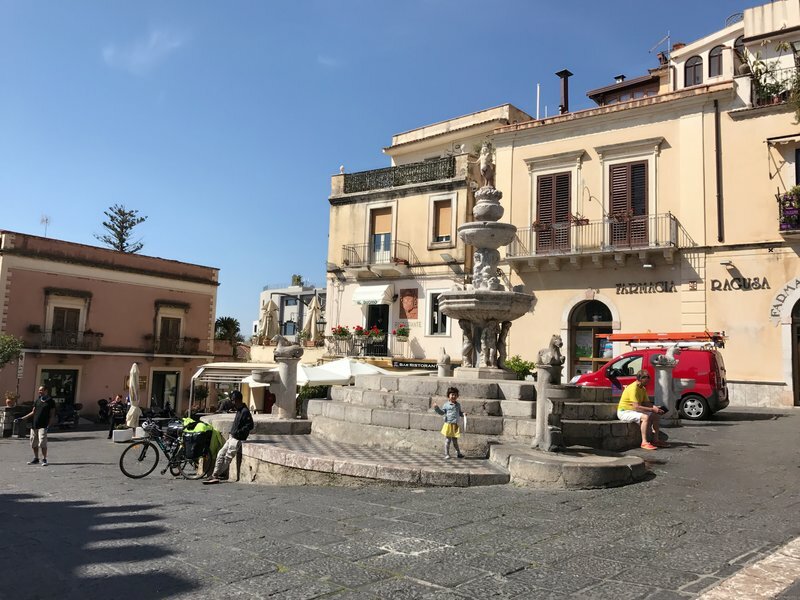 In the narrow, winding streets around the center we found rows of immaculate Sicilian townhouses, fountains, and statues. The mountains of the Parca delle Madonie surrounded us in every direction. 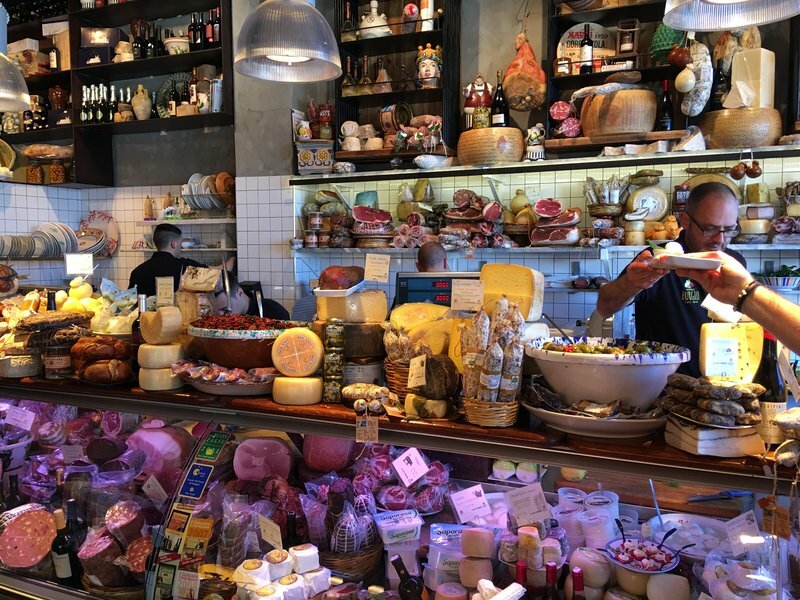 We found a salumeria on the way back to the car where the proprietor cheerfully encouraged us to try a dozen samples of cured ham before we relented and bought a whole sausage. 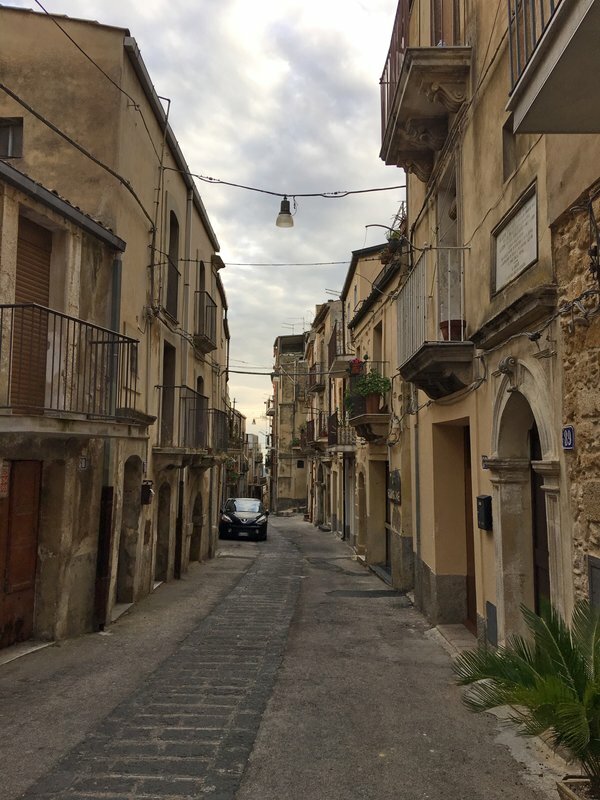 Leaving Castelbuono, I was optimistic we still had time to make the detour to Gangi and still arrive in Enna in time for dinner. 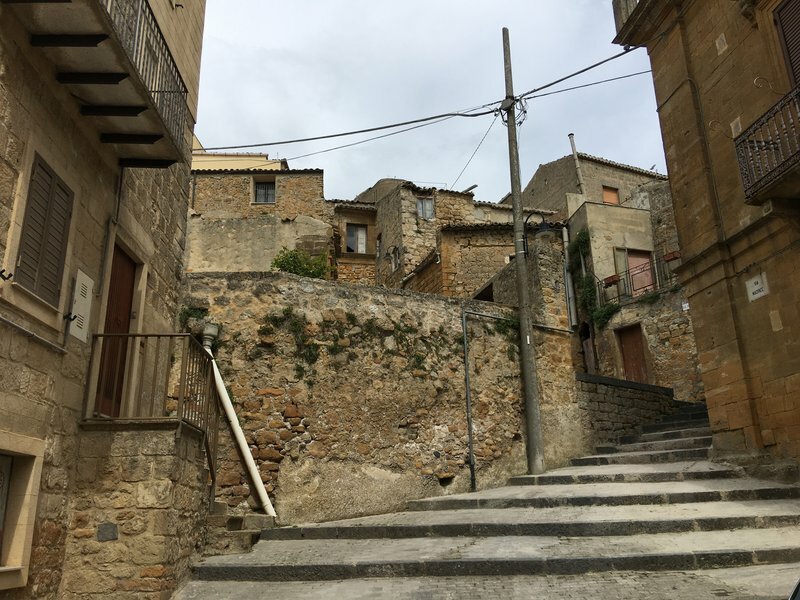 Gangi is one of those classic ancient Sicilian villages in which houses spill down a hillside almost like lava flowing from a volcano. 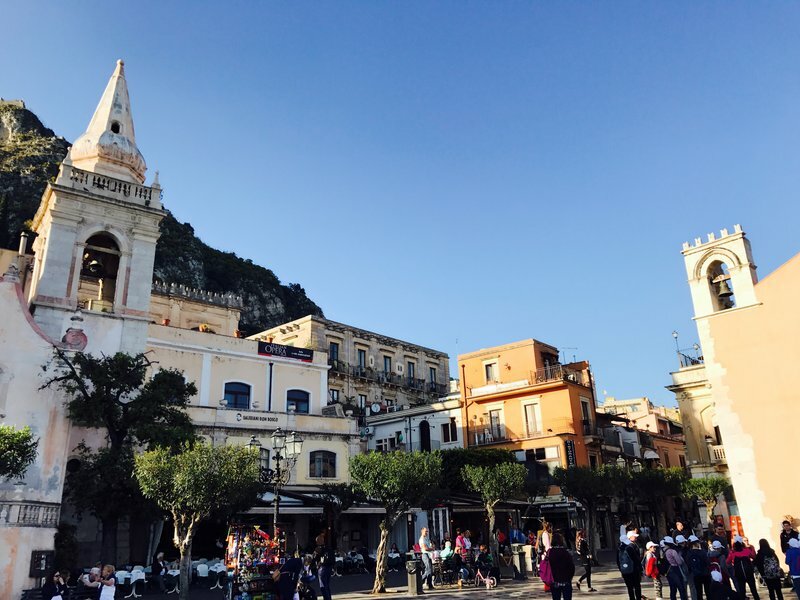 In 2014, the town was voted the most beautiful in Sicily in a television contest. However, soon after leaving Castelbuono we ran into a new problem. As we crossed the edge of the Parco delle Madonie the road became very tortuous with a seemingly neverending series of hairpin turns. Spenser began crying loudly and persistently in the back. 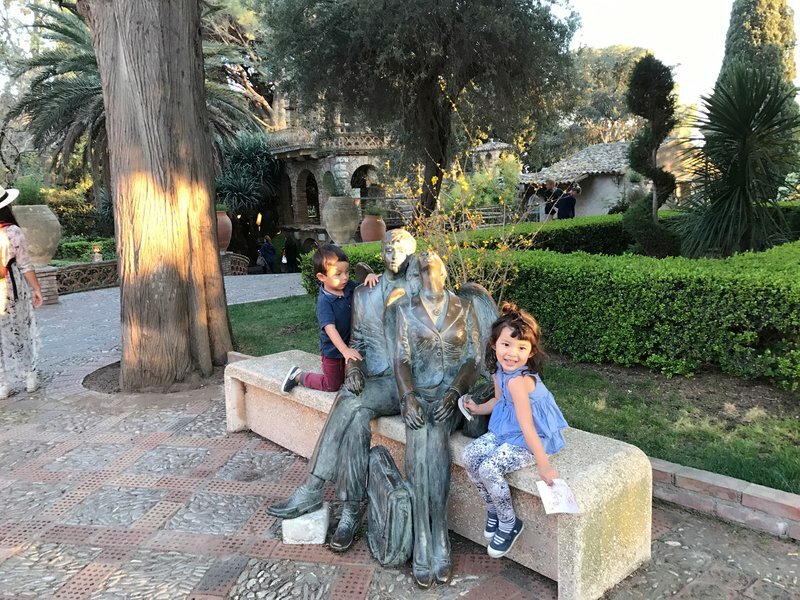 The previous day he had cried and thrown up once on the way back down to the coast from Caccamo, but we chalked it up to an excess of ice cream. This time his crying kept getting louder and more insistent so we finally pulled the car over to check on him, and as soon as we stopped he threw up all over himself. It was clear at this point that Spenser was carsick. 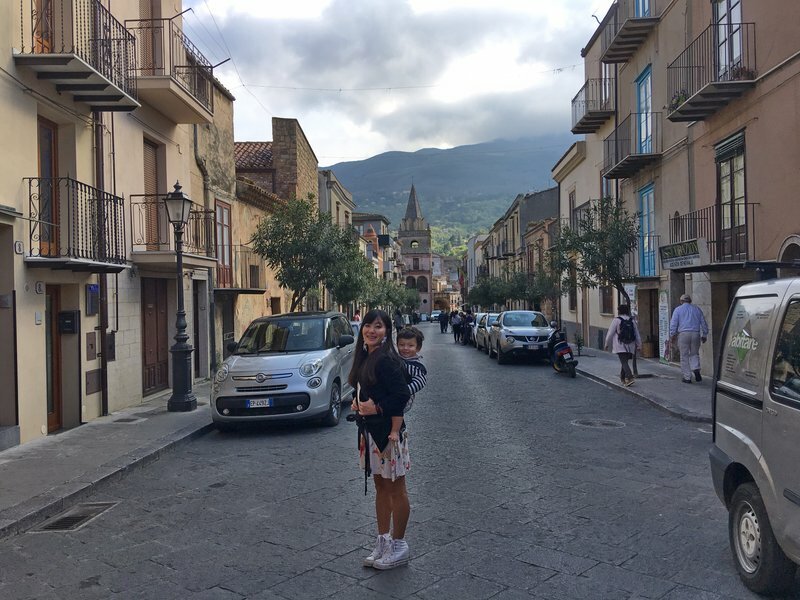 I was surprised since he'd never had a problem on our other road trips and the other two kids had never been carsick, but there was no denying it now and we still had at least an hour and a half of mountainous driving to Enna ahead of us. 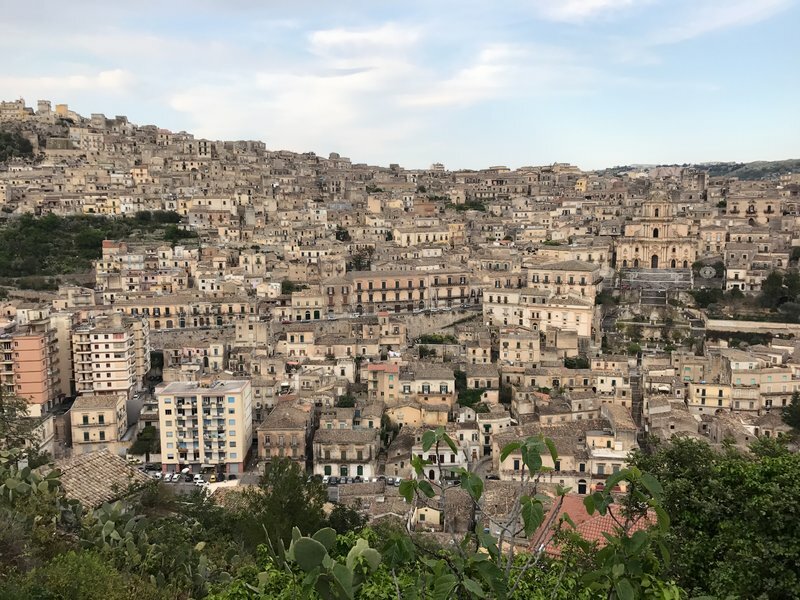 I immediately decided to scratch our plan to visit Gangi, and the small town became the first casualty of our itinerary. 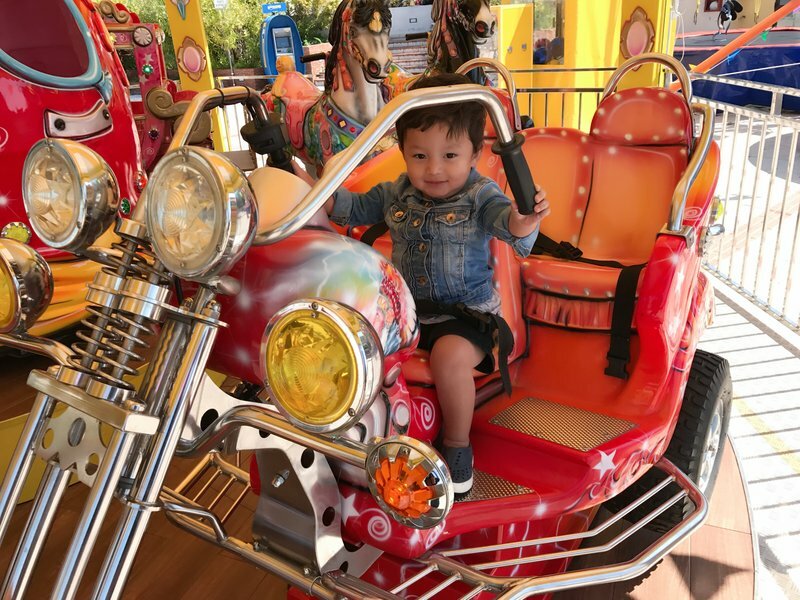 We cleaned Spenser up as best we could and I set a new course directly for Enna, slowing the car to a crawl every time we came to a sharp turn. I expected Spenser to begin his wailing again at any moment, but after a short time he fell asleep and didn't complain for the rest of the trip. 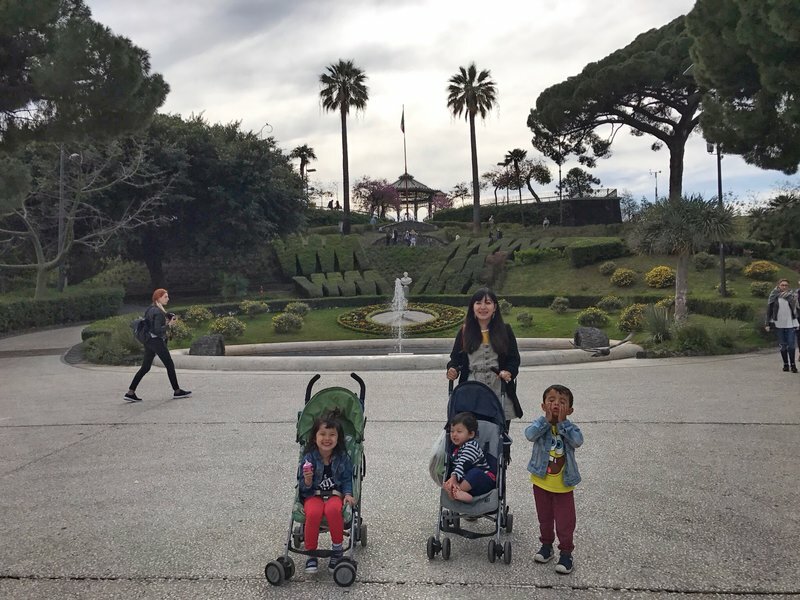 There was a surprising traffic jam as we entered the old town, and then we drove twice around central Piazza Vittorio Emanuele unable to locate our hotel. Eventually we pulled over and I jumped out to hunt for the hotel on foot. 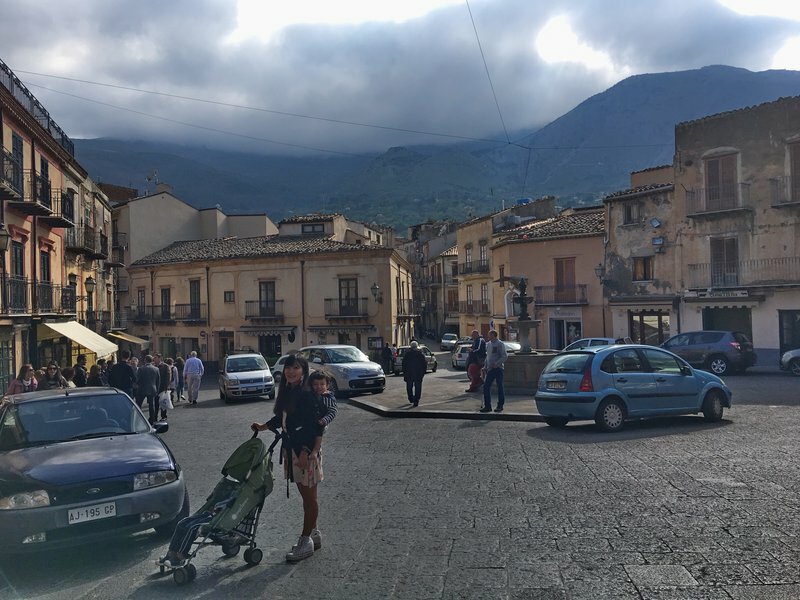 Palermo and Cefalù had been chilly at night, but mountaintop Enna was windy and freezing cold. 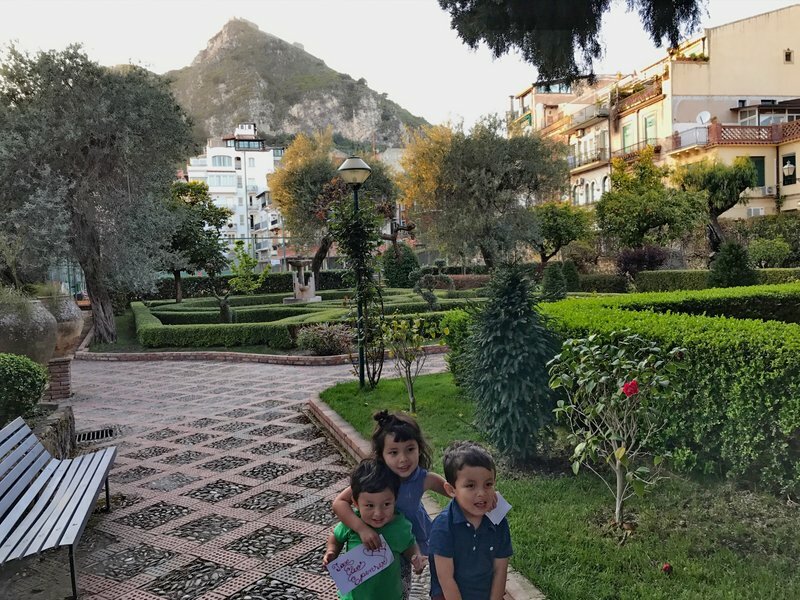 I finally found Una Casa al Belvedere set back from the square on a small plaza that overlooked the valley below. 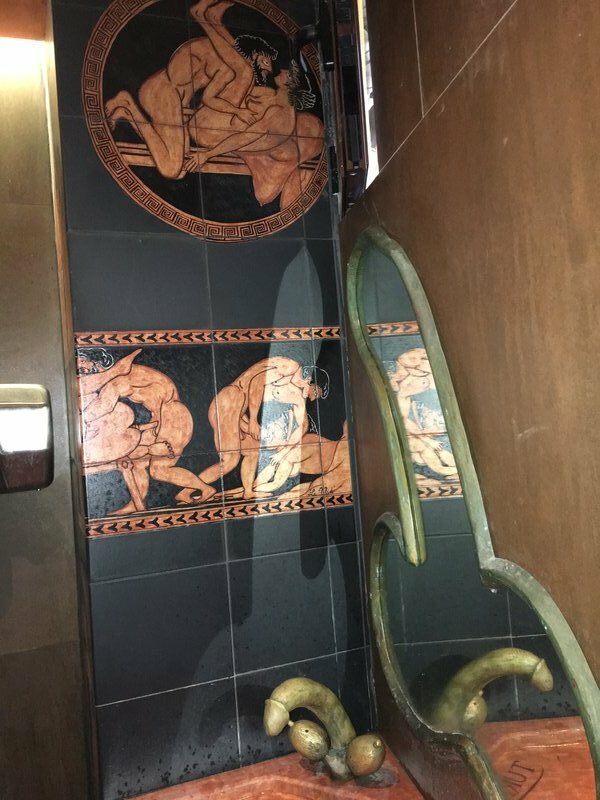 It was one of those hotels that occupies part of a larger building, so I had to get buzzed in and take an elevator to reception. Our room was modern, pretty, and comfortable justifying the high rating on Booking.com. Once I'd brought everyone up, it was tough to drag ourselves back out to the windy streets but getting dinner was non-negotiable. We found a decent-enough place and managed to fill our stomachs before crashing for the night. The next morning I pulled the curtain aside and was greeted with one of the most amazing views I have ever encountered from a hotel room. 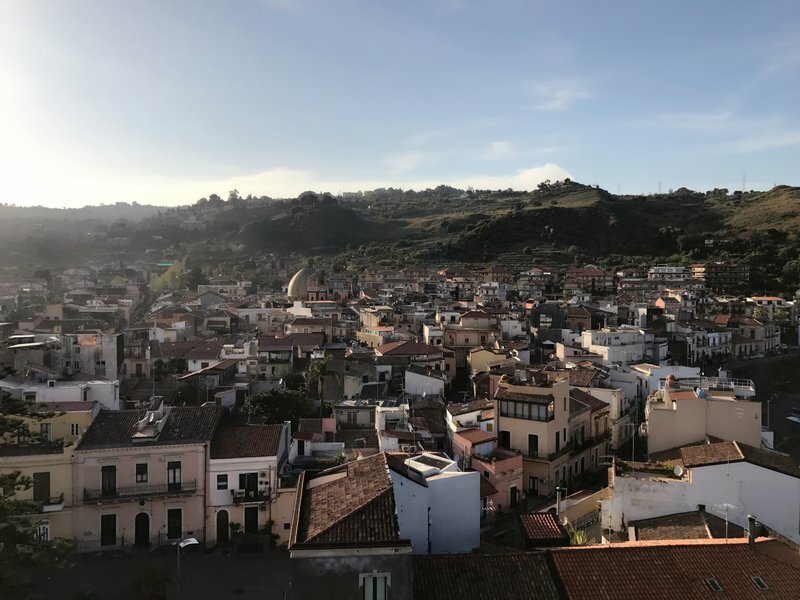 The hotel was perched right on the edge of the mountainside and we could see the entire landscape of northwestern Sicily all the way to Mount Etna. 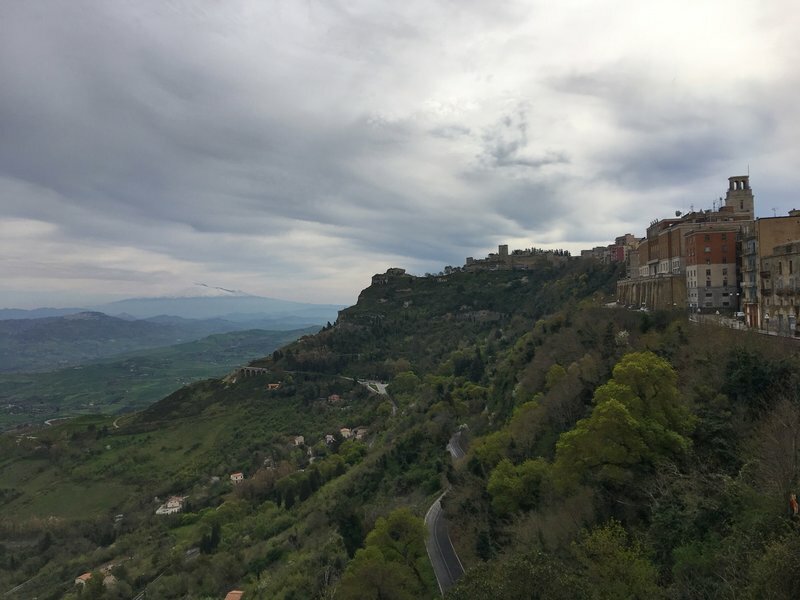 I could see the jumble of another old town atop a mountain just to our north and concluded this must be Calascibetta, a town I was already planning to visit. 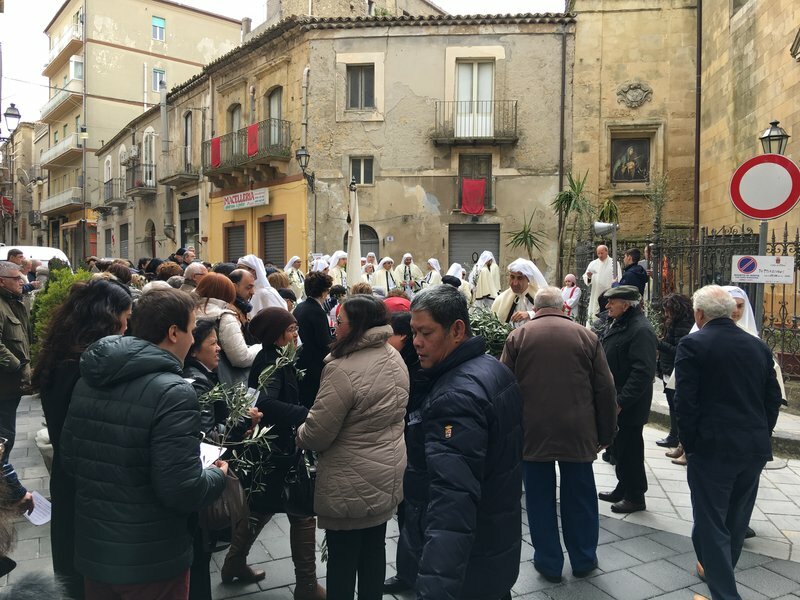 It was Palm Sunday, and apparently there was an Easter procession somewhere in the lower part of town. The receptionist pointed out the route on a map, but it sounded confusing and we decided we would probably just run into the procession at some point. 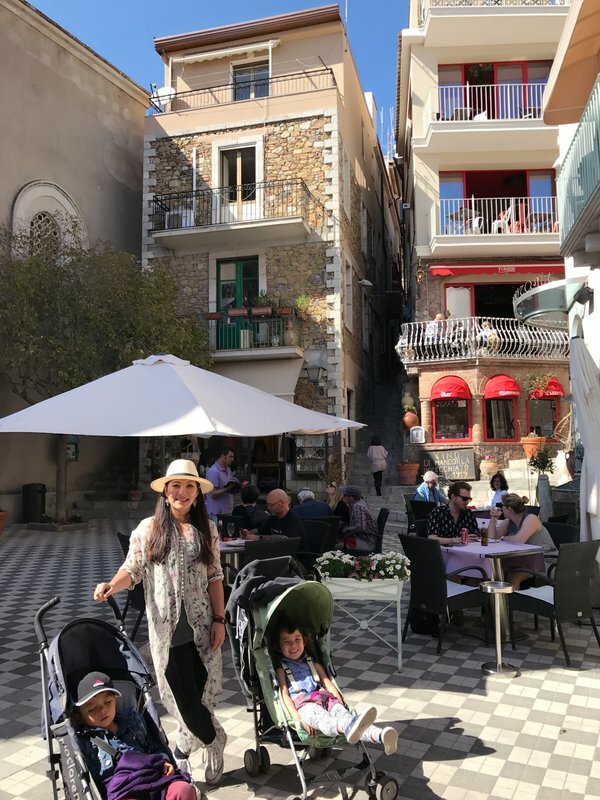 Instead, we decided to walk to the Castello di Lombardia at the far end of the old town and absorb some local atmosphere. 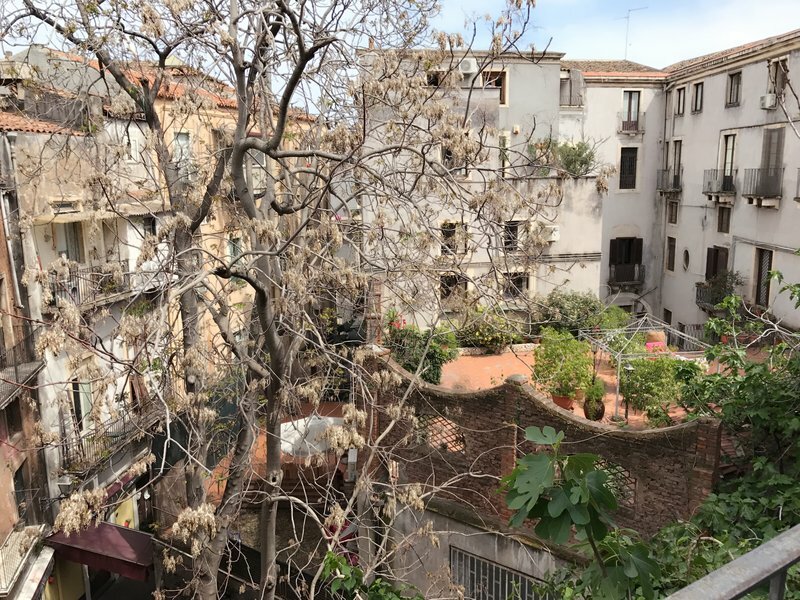 The streets were almost deserted, either because everyone was at the Easter procession or because it was a cold Sunday morning. 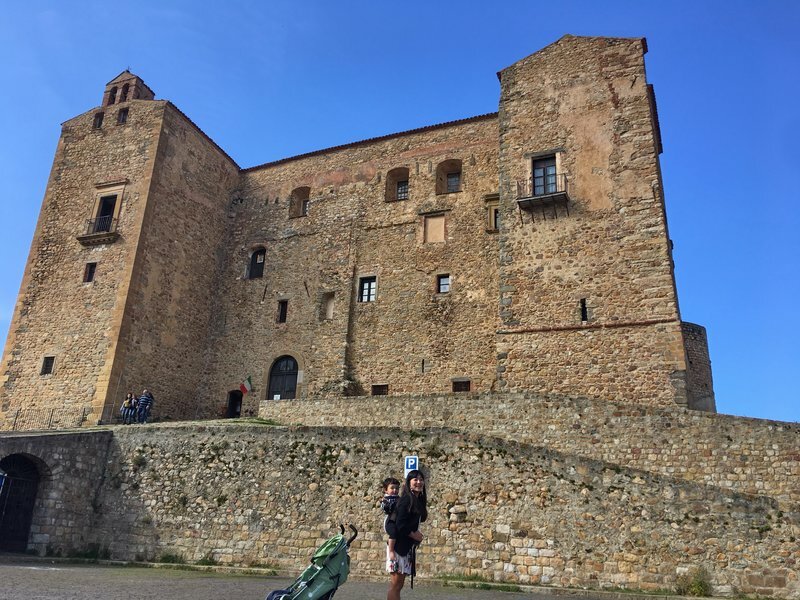 The Castello was impressively large from the outside, but we'd gotten our fill of castles the other day at Caccamo and opted not to join the tourists inside. Instead we made our way back through town towards the car. On the way we ran into a small Easter procession outside of a church, although it probably wasn't the one we'd been advised to see. 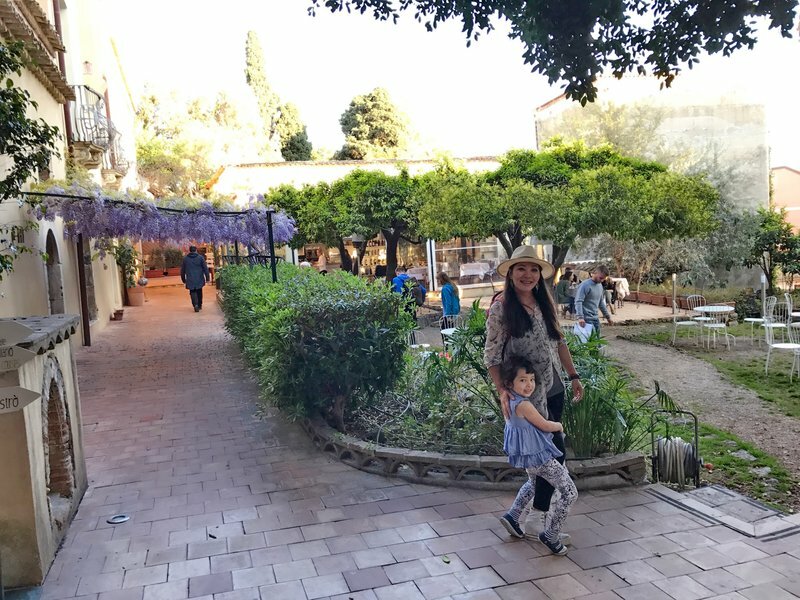 The kids had a little competition to collect the most olive branches, which the white-cloaked congregants were passing out as a symbol of peace. 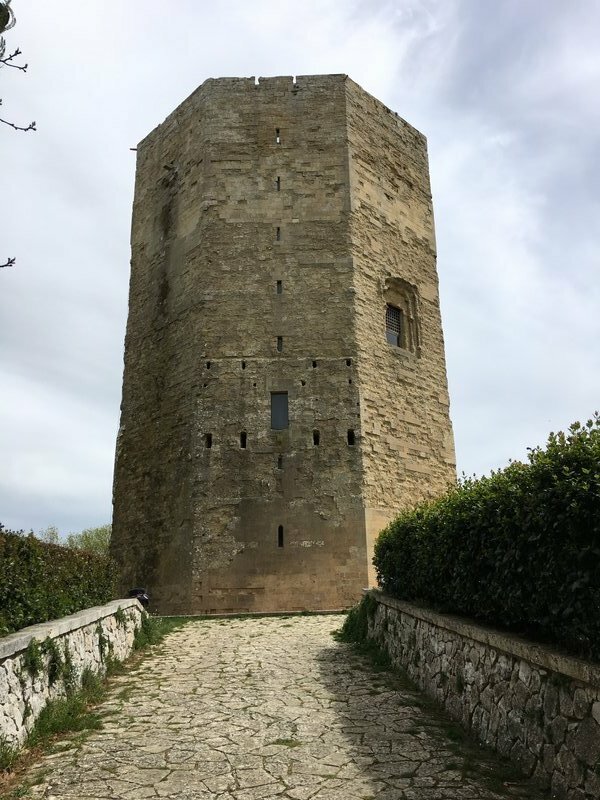 We drove down to the lower part of town to see the Torre di Federico II, an octagonal stone tower that is a remnant of Enna's original defense fortifications. 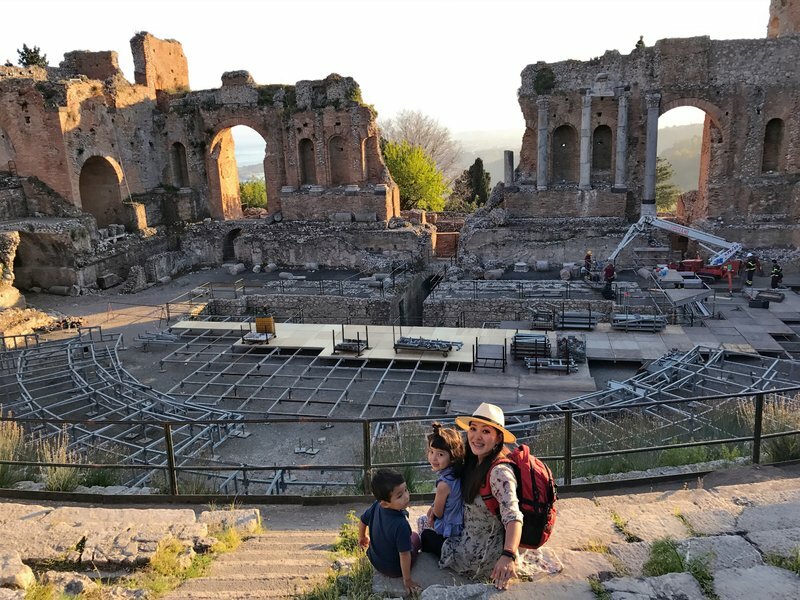 By the time we arrived, the kids had fallen asleep so I went on my own which was fortuitous as it turned out to be closed. The tower was still an interesting sight from the outside, perched in solitary splendor atop a hill at the center of a public park. 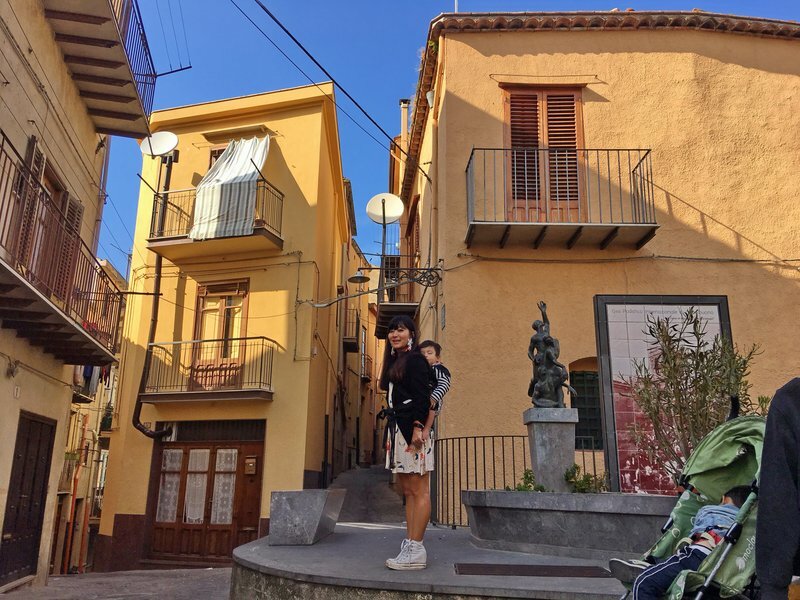 Before leaving Enna, we had an undistinguished lunch at a hotel restaurant in the old town and then made the short drive to Calascibetta. 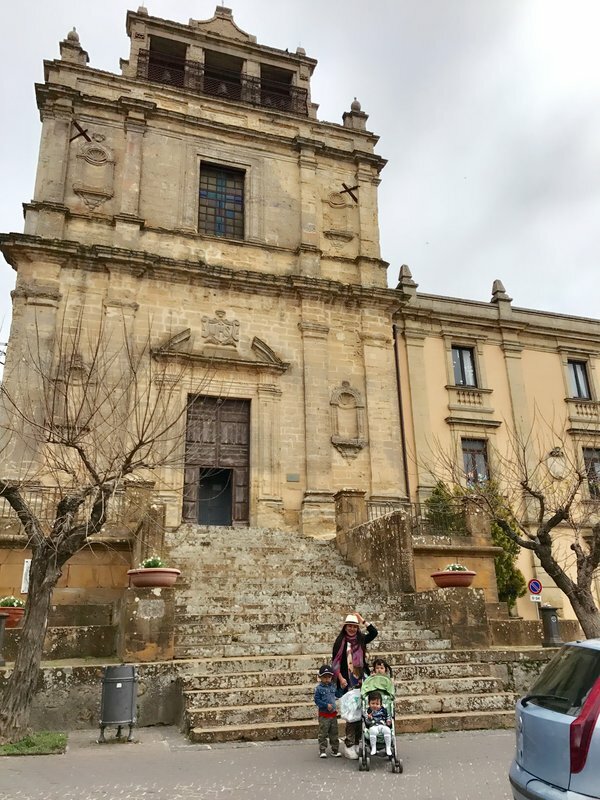 I had no particular destination in mind for the tiny hilltop town, so I arbitrarily chose the medieval church Chiesa Madre which was mentioned in the Lonely Planet. 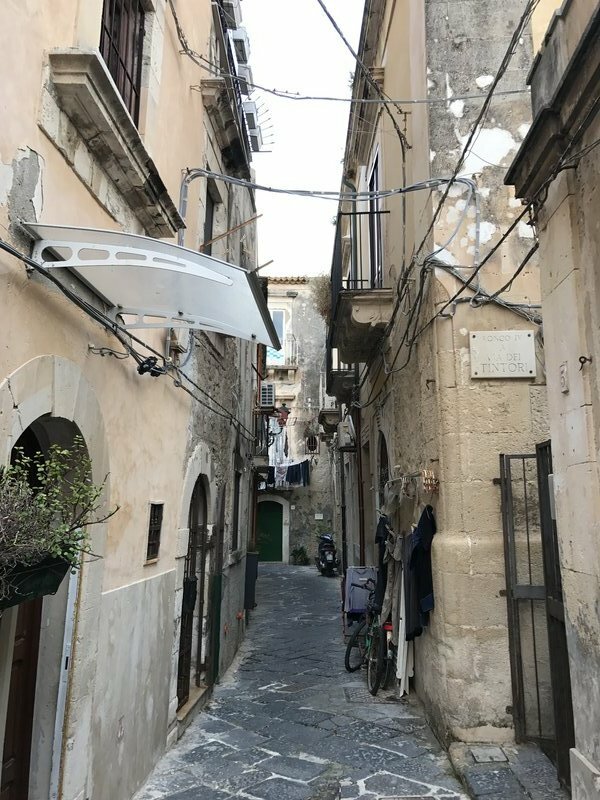 We parked in the central square and worked our way upward through a series of staircases and alleys flanked by ancient limestone walls. Eventually we reached the stately facade of the old church, where we found amazing views over the lowlands to Mt. Etna. 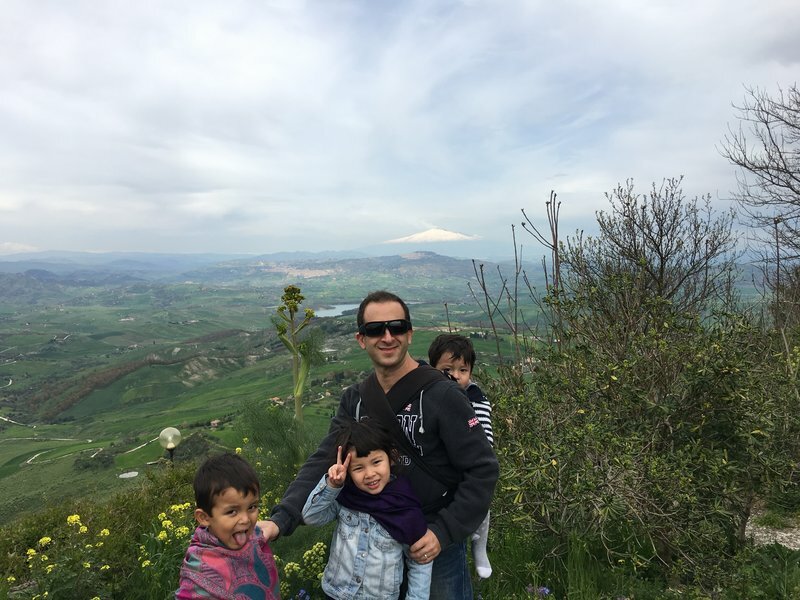 The volcano's icy peak seemed to float in the sky above the countryside. 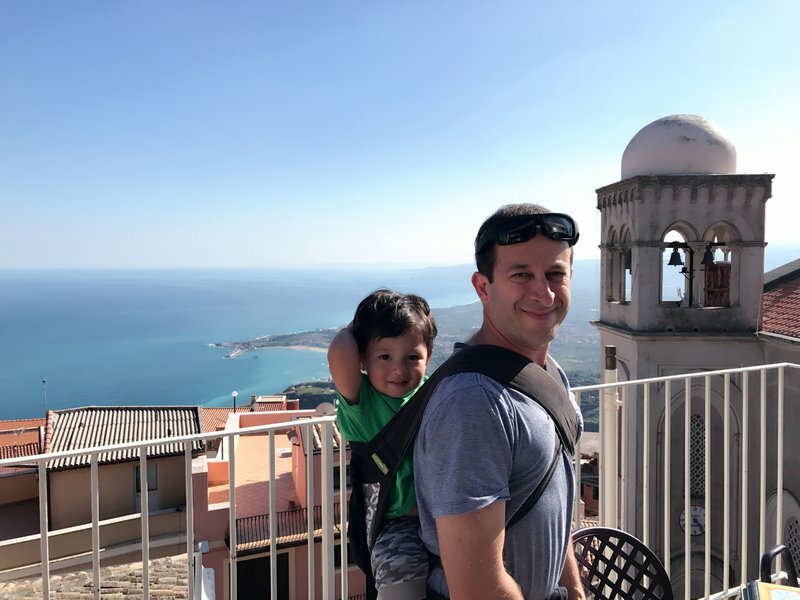 We had a good amount of driving in Sicily's interior planned for the rest of the day, so I did everything I could think of to stave off Spenser's motion sickness. We hadn't given him any milk or dairy that morning, we stripped him down to his T-shirt, and for a coup de grace I slipped him half a tablet of orally-disintegrating Zofran as nausea prophylaxis. I'm not sure if our interventions had any effect, or we were just luckier with the roads, but he didn't have any problems that day. 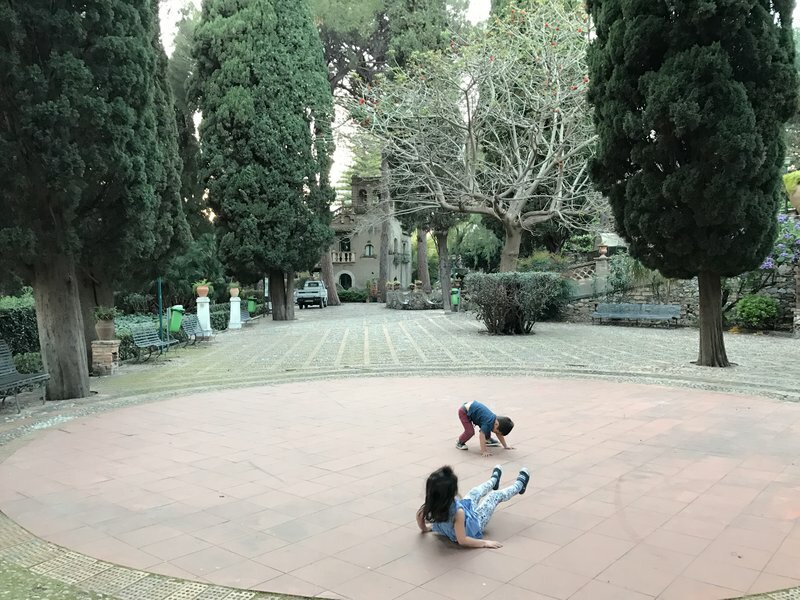 We had an uneventful drive to Piazza Armerina, where we spent about an hour looking at the mosaics at Villa Romana del Casale. 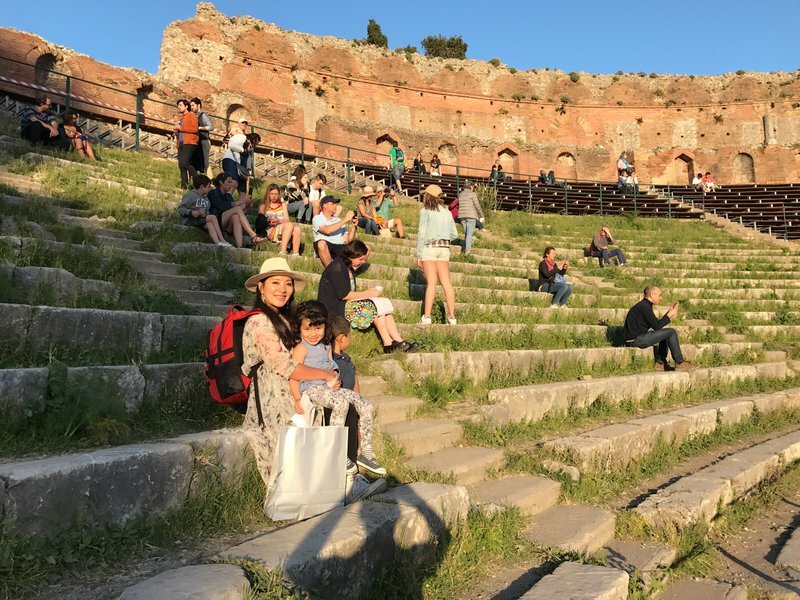 As I've mentioned many time in the past in my blog, we usually don't go out of our way to see museums, ruins and relics. 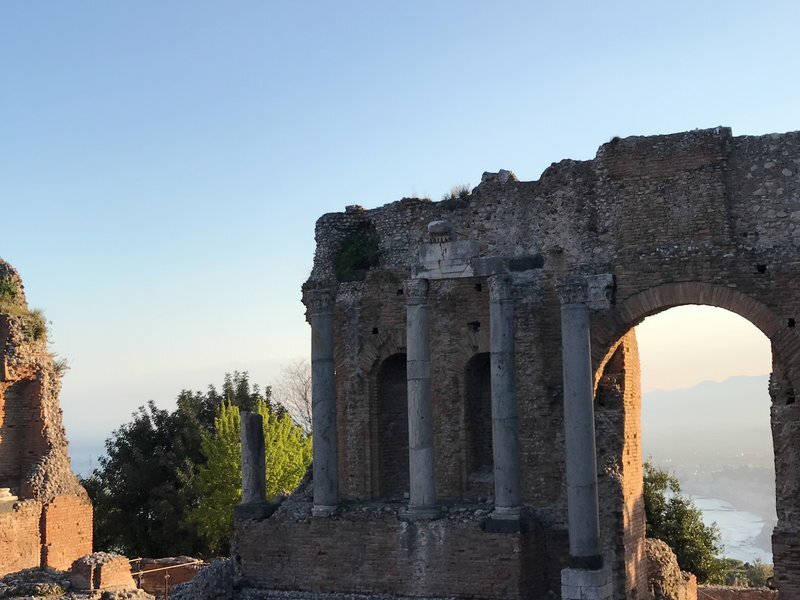 In the case of Villa Romana, the Lonely Planet had spoken of the site so glowingly that I didn't want to feel like we'd missed something unforgettable. 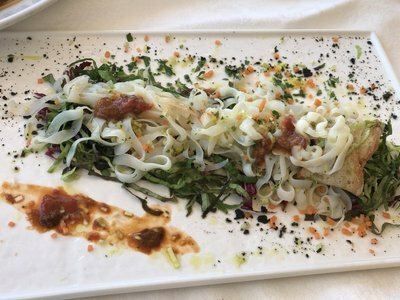 As it turned out, I could have given Villa Romana a miss without any regrets. The mosaics were housed in an unattractive shed and could only be viewed from overhead walkways. Google Images would provide the same experience from the comfort of one's home. Oddly enough Cleo and Ian seemed to really enjoy them, especially the girls in bikinis, and repeatedly requested to be boosted over the railings for better views. 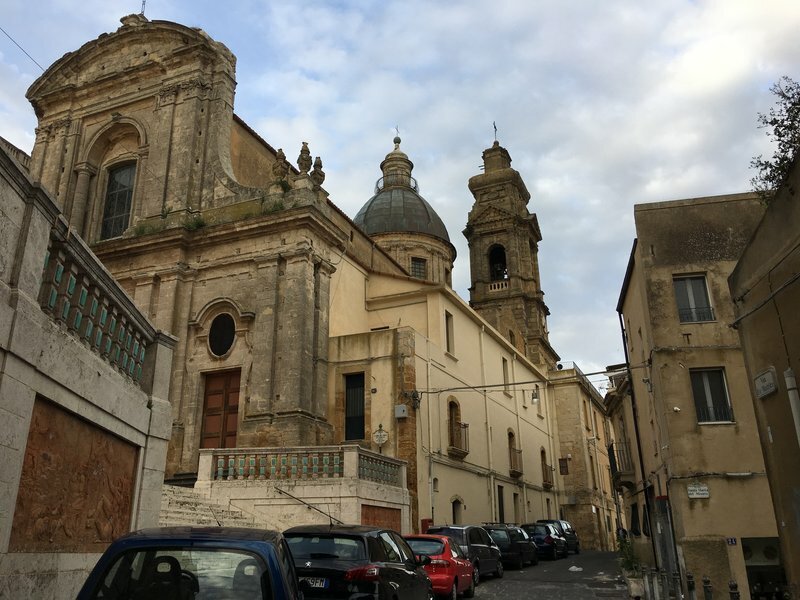 We had to peel out of Villa Romana to make it to Caltagirone before sunset. At one point, I allowed our GPS to divert us from the main road onto a narrow, pothole-filled shortcut that I'm fairly sure didn't save us any time. However, the new route did take us through some countryside that was so amazing that at one point we had to pull over for photos. 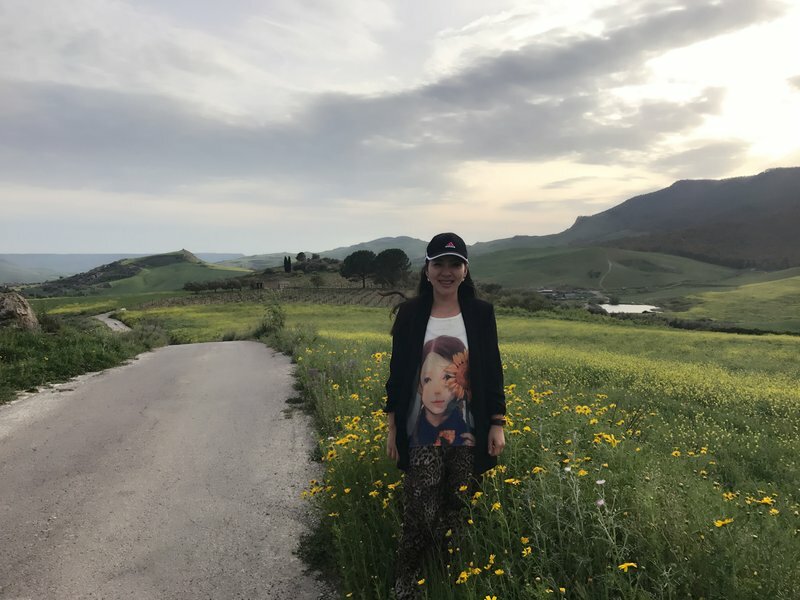 By pure coincidence, Mei Ling's outfit complemented the scenery perfectly. 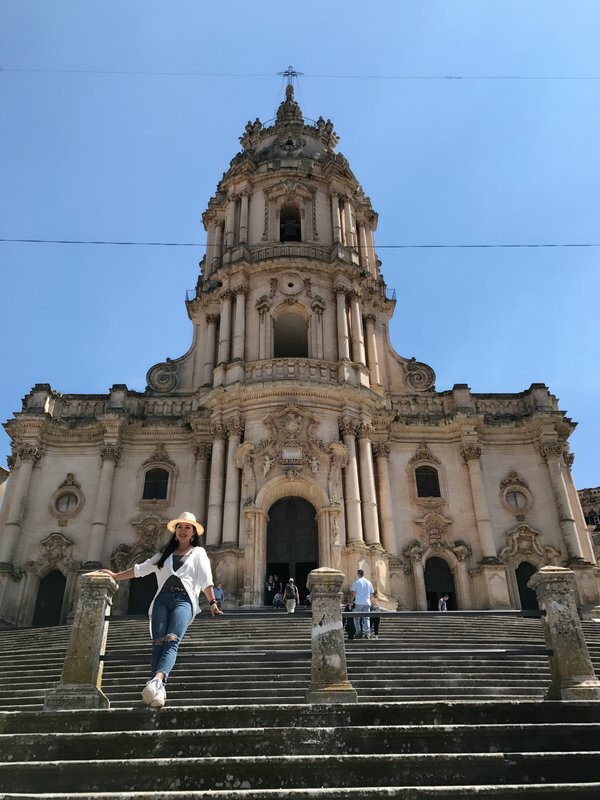 Our only destination in Caltagirone was the Scalinata di Santa Maria del Monte, a 142-step flight of outdoor stairs that extends from the main square all the way up to the church at the crest of the town. 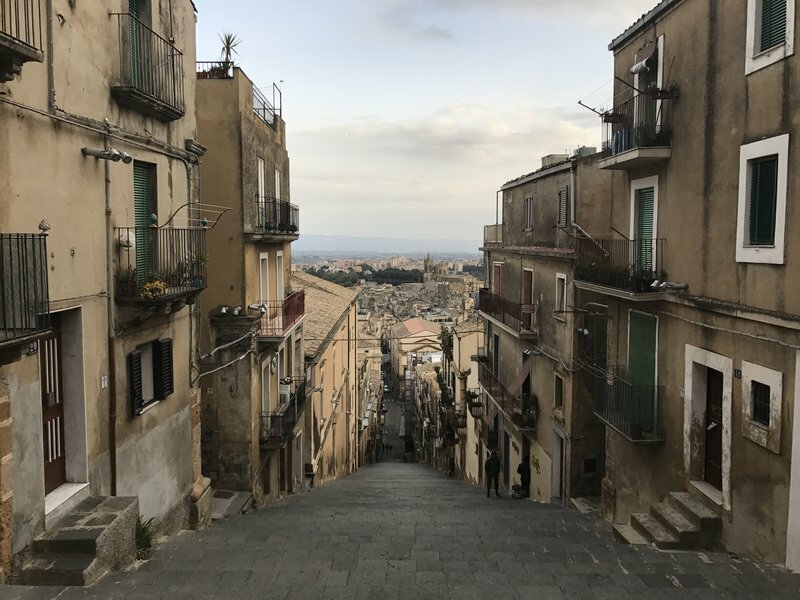 Gazing down the staircase was satisfyingly vertiginous, but it was the beautiful road through silent town homes and churches that made me regret not having allowed ourselves more time to explore Caltagirone.